A New Year brought a smaller number of adventures and projects as I've had some time away looking after a close relative but this has been a lovely way to reconnect with the things in life that matter most. With a colder start to the year though maybe a little hibernation was right on time! 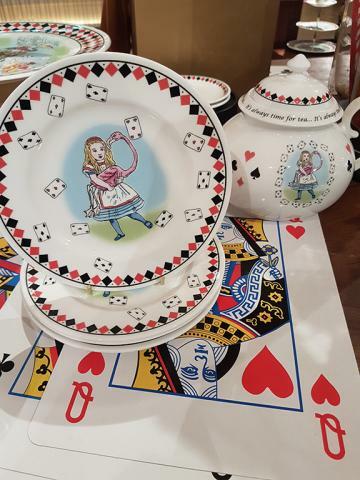 For many children growing up in the UK and around the world, one of the childhood classic stories that they hear is the magical adventure of Alice in Wonderland written by Lewis Carroll, also known in his academic life as Christchurch College Oxford Maths Professor Charles Dodgson. How topsy-turvy it is today that people separate the world of arts and science when one of our greatest British fantasy writers was also a scientist, how very curious. 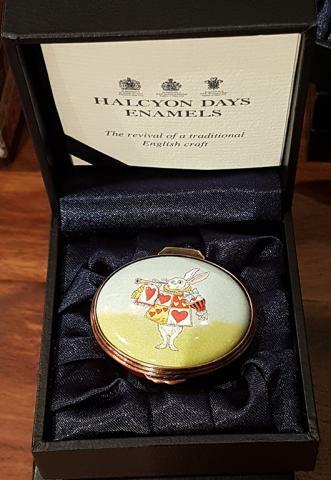 To celebrate 150 years since the launch of the first print of Alice in Wonderland Halcyon Days collaborated with Fortnum and Mason to create a special Tea service collection. 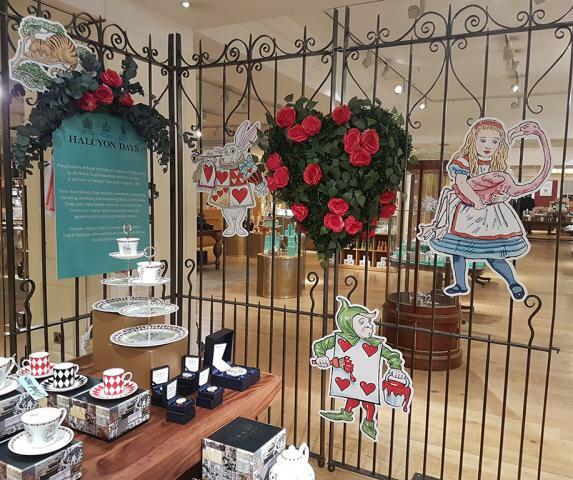 Magical thinking and a world of wonders seem to fit naturally in the elaborate halls of Fortnum and Mason. 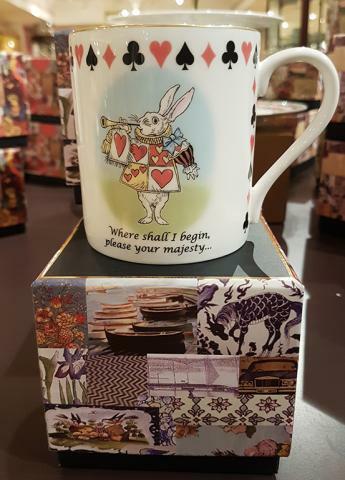 The famous Department store located in on Piccadilly in St James London is now over 300 years old and is fastidious in it's catering to the needs of clients in a way that I'm sure the White Rabbit would approve of. 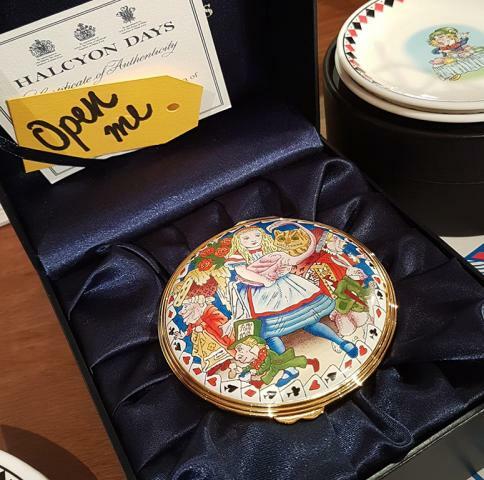 Fine English Bone China company Halcyon Days have been established for over 65 years and alongside classic understated flatware, tea services and ornaments, they produce several themed collections each year that explore gems of British Heritage. Collaborators have also included the beautiful Gordon Walled Castle Estate in Scotland, home to the Gordon Lennox family. Within the treasure trove of British culture and history there is much to find. In a magical garden that popped up amongst picnic hampers and ice creams we where welcomed into Alice's world of love, laughter and nonsense. While admittedly the prices are not inexpensive there is also a great pleasure to be had in knowing that this a company that supports British craft and manufacturing and producing the highest standards of work illustrating brilliant ideas. For me it also brought back memories of childhood and home with a local familiar landmark featuring a connection to the genesis of the Alice story in Carroll's youth. 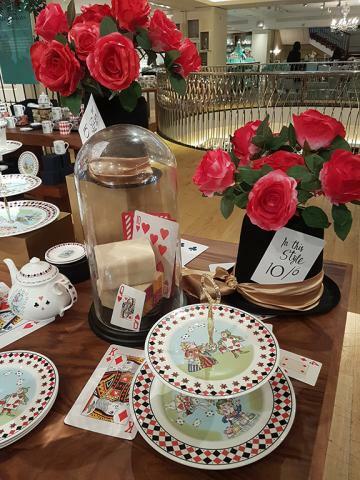 There's a fascinating juxtaposition in the notions of formal fine china tea services and the happy chaos of the world of Alice but all fits together perfectly with Roses from the Mad Hatters hat strewn across the table. 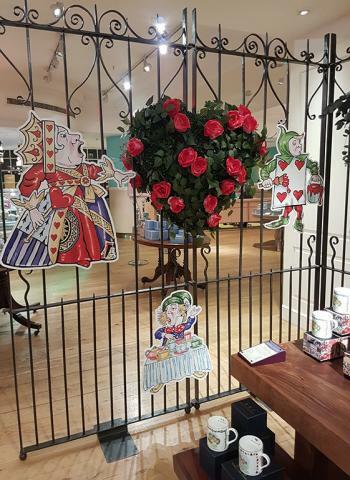 Amongst the seeming rules of life in the Royal Court of the Queen of Hearts we are urged not to take things too seriously and to know that there is always room for fun as well as surprise in a social merry-go-round. 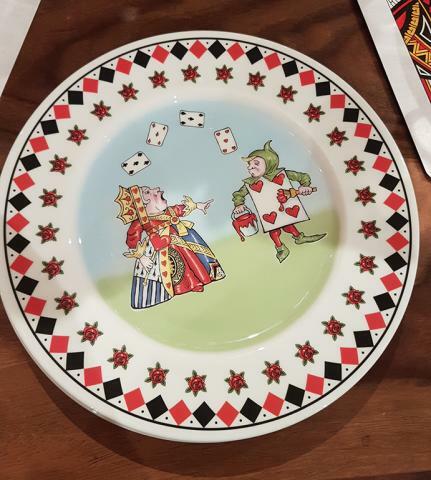 Plates are adorned with Red and Black diamonds at the border from the traditional playing card suits and this harks back to another real-life Royal court of Henry VII and Elizabeth of York who were the 'models' of the leading characters in the traditional card deck. Eating your chosen cakes or sandwiches once again reveals the characters of the story. Well rounded Tea Pots are at the ready just waiting to pour hot cups of Tea. Your regular blend favourite or one of the dozens of speciality teas on offer perhaps from Fortnum and Mason itself. 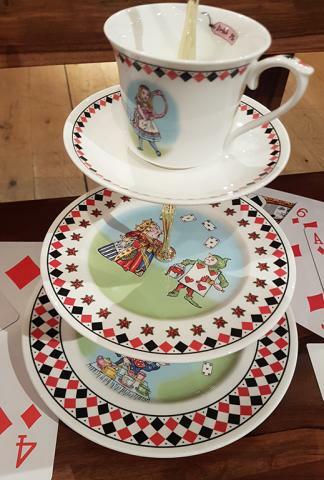 There are elegant tulip shaped tea cups with illustrations of Alice holding her croquet flamingo and also a set of fine mugs that carry illustrations with one of the many motto's from the Alice in Wonderland novel. The hand painted illustrations are exquisite, from the folds of Alice's dress and her tumbling locks, to the smile of the Cheshire Cat and the neat suit of the White Rabbit. 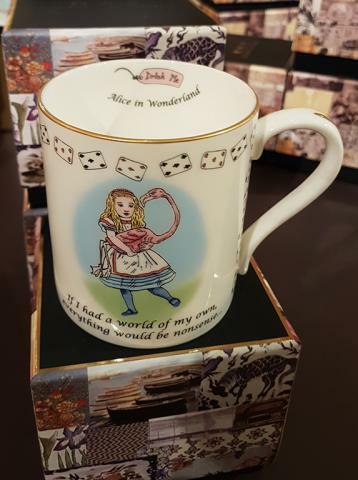 Little surprises to raise a smile such as the 'Drink Me' label that makes Alice tiny enough to fit into the Wonderland World or the eyes and whiskers of the Cheshire Cat that remain as he disappears. These pieces make fun additions to a collection at home or pretty gifts for treasured friends. They also reach out to an age that was pre-digital when children used their imagination more to play games, it was not so long ago at all. 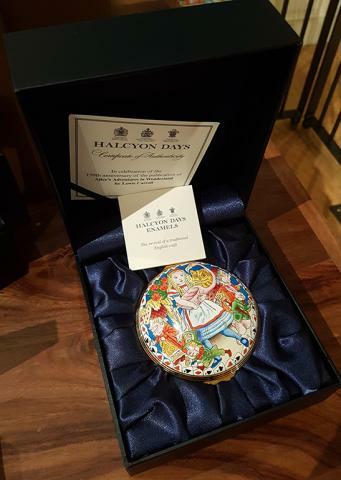 Palm-sized enamels are one of the specialties of Halcyon Days over many decades. They make pretty gifts and can be used in many ways including as mini jewellery boxes. To the right trinket trays become perfect platters for sandwiches, scones, cakes, macaroons, or whatever you would wish for. 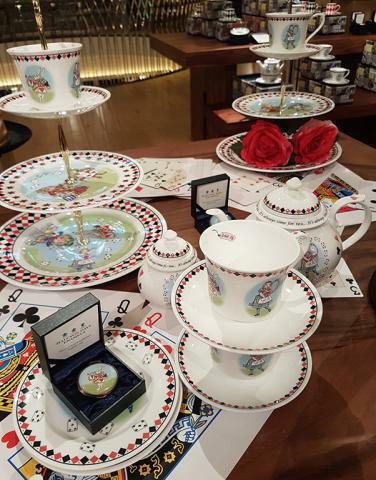 A handy set of pieces to have on standby during a Lunch or Afternoon Tea. 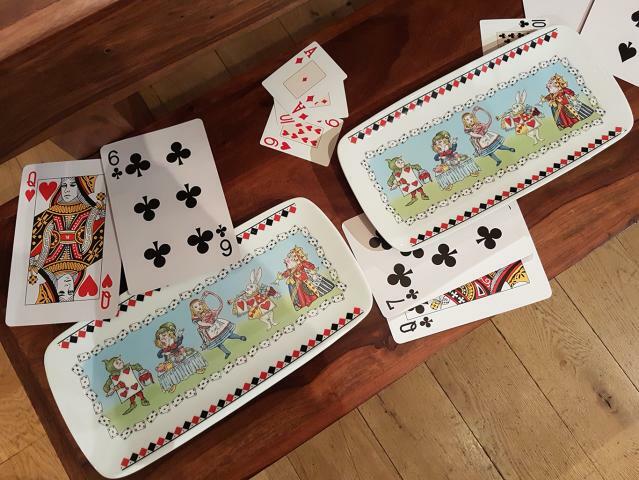 Playing cards strew the table as if a game has been played and then abandoned for another fun pursuit mid-hand as the merry-go-round of adventures in Wonderland takes another turn. 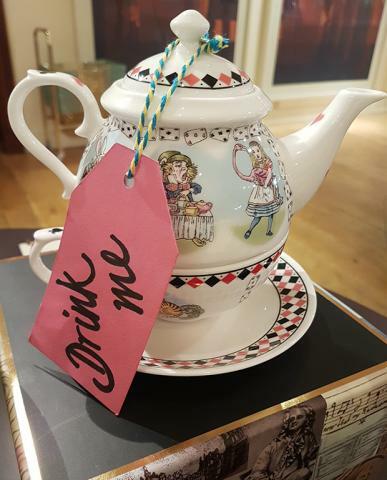 The Tea Pot for one features across many of the Halcyon Days collections and with the inviting 'Drink Me' label for this piece, who could resist. 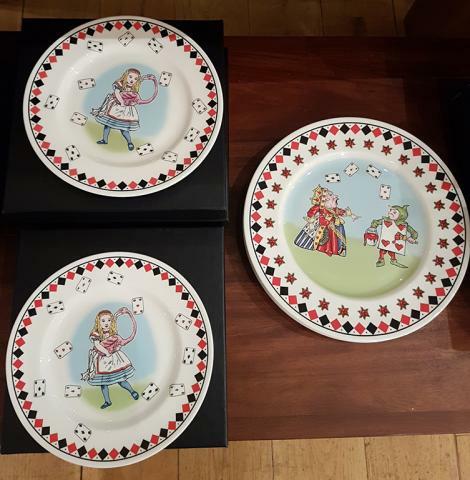 The painting workmanship is beautiful and want to turn it round to see the characters that Alice met on her journey spring into life as you do. 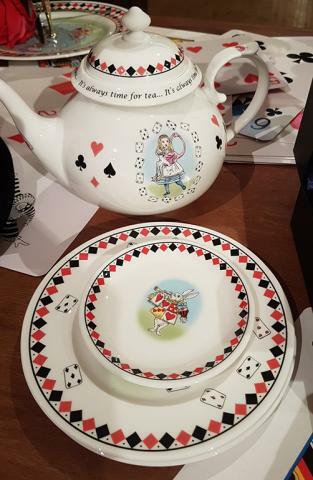 There is also a belief amongst some that turning a tea pot around 3 times is good luck too, I'm not sure if this is true but I would expect the Mad Hatter would be open to giving it go. Sitting perfectly above it's cup and saucer this a great piece to have at your desk side should you happen to be writing :-) and a happy thing to look at while you're pausing for a few moments to think. It's good for a giggle anytime though. 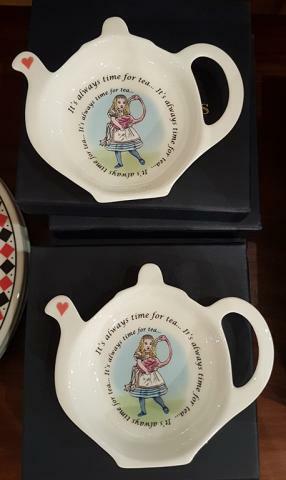 Teabag Tidy's also make up part of the Teaware collections and these are fun little things to have in the kitchen and can make great stocking fillers at Christmas or mini-gifts through the year. 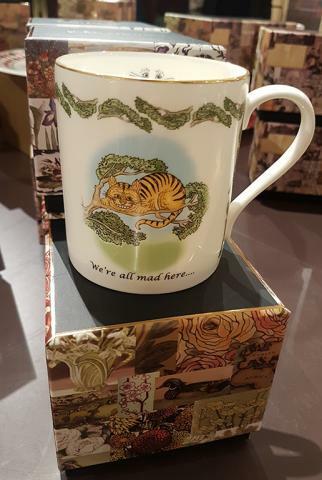 It's a beautiful collection and Alice invites us on a journey to relax, enjoy, to be curious, discover and step into a new world where even taking tea can lead to the start of an adventure. the UK before seeing the fuller range in (of course) on my regular pharmacy spots on one of my trips to Paris. I can honestly, for a girl who favours the natural approach of using the most natural skincare products (and even crushed vegetable fruits) this brand keeps producing wonderful gentle products that do make a difference. 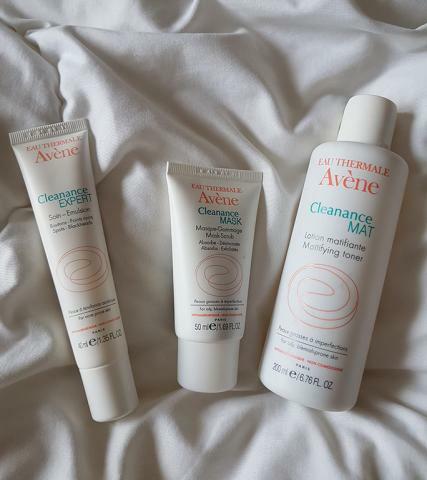 So as you can see I have a few treats from Avene to show you here and no doubt there will be a few more coming in the future. Firstly a look at some pieces from the Cleanance range. As the name suggests this is a range that speicalises in cleansing the skin with that extra bit of help. It's perfect for blackheads and oil-prone skin at any age and as someone who partly lives in the big city, I think it's also good to have one or two products like this on stand-by to defeat the effects of pollution on the skin too. to gently squeeze out a tiny amount, about the size of an orange pip for each area that you wish to apply and gently rub it in with small circular sweeps. I used a small amount of this on my nose as I get a tiny oil build-up sometimes and found that it disappears quickly into the skin without feeling 'filmy' or greasy in any way on the dermis surface. It is gentle and Avene's products feel as though they could almost be very slightly alkaline in their mineral composition. After two days of using this morning and evening, I personally felt that my skin felt clearer around the nose and certainly more under control. Alternative options that you can use to cleanse across the surface of the skin include the Cleanance Mask. This is a very simple cleansing Mask Scrub that you apply gently across the skin, leave for 5 minutes and then rinse off. Again I've noticed the surface of the skin feeling a little smoother but for me, as I don't suffer from day by day oil in the skin, it's a handy thing to have on stand by. You can follow the Mask Scrub or the black head Cream with an allover sweep of the Mattifying Toner and this will give a second layer of protection to keep the skin cleansed. Alternatively you could choose to use the Toner by itself as a straightforward one-step cleanse. Here too there is a gentle milky texture that feels natural as it gently blends into the skin. The Eau Thermale range channels the minerals from Avene's thermal waters to maximum effect and it is used through a number of it's products. A nice gentle body cream is something that we all like to have in the cupboard either for a special treat or as part of a day to day beauty routine. 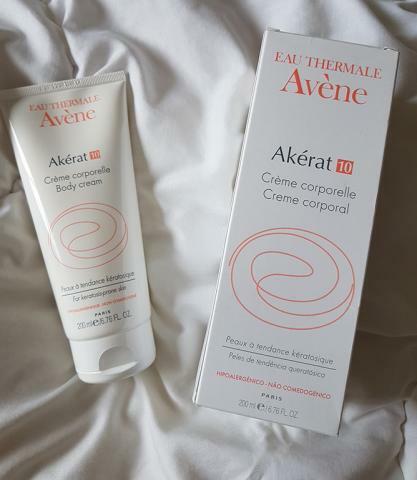 The Akerat 10 Body Cream is specially formulated to reduce the scaliness of skin. I've used this on elbows that have stubbornly resisted regular rich body cream from some well known names and have found that it works. Again when thinking about Avene, it's less cosmetic and more about skin healing and once again it did the trick. 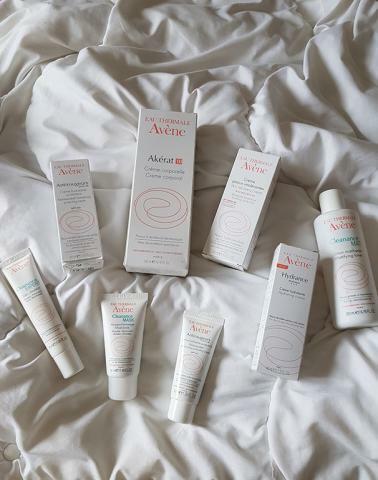 This was part of the gifting package that I received from the Avene team in London after having such a good experience with some of their products and once again it receives a big thumbs up from me. I personally have noticed a difference very quickly with this and without any kind of acidic harshness or oily-slickness that you may feel with other products. 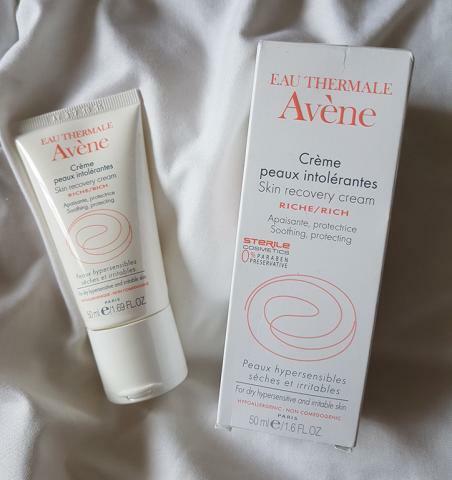 For skin that needs that extra special type of care the skin recovery cream from Avene gently covers a lot of bases. From sunburn to skin that is super-sensitive and doesn't 'like' most cosmetic skincare products this is an ideal treat. It's one you may want to point out to friends with ultra-sensitive skin as are many products in the range and I would strongly recommend asking form a sample or trying some in-store to skin test. With medical advice this is possibly something that will benefit people with small scars and for anyone with dry supersensitve skin it is a blessing. It's the sort of piece of advice that you would pass onto friends and Avene is definitely something that I'm happy to share with you here. 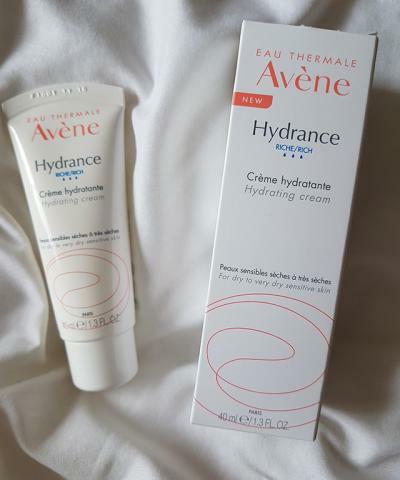 Another option for dry skin is the Hydrance Rich cream. This is for dry to very dry skin and once again it's a great skin-saver to pop into the purse. One thing that jumps to mind for me pretty quickly is cabin dried skin after a flight. Even a short flight of about an hour can dry out the skin a touch and for anything over 2 hours I would recommend that everyone have something in their cabin bag that they can apply before and during a flight. This tube is a handy 40ml so won't break any rules and hopefully leave you arriving fresh and prepared at your journey's end. Skin redness is a characteristic that many people have whether it be Rosecea or simple blemishes. 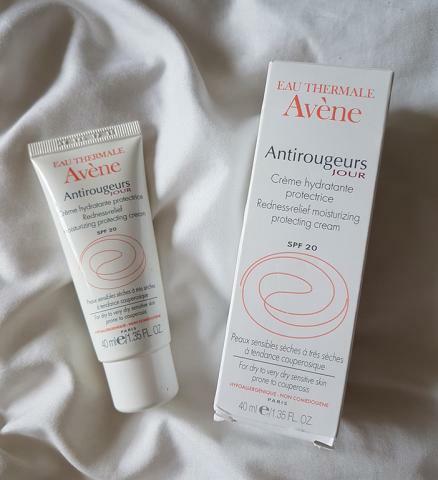 This Avene cream to the right that also contains SPF 20 is another strong contender for you to consider if you have skin redness that makes you feel a little self conscious or if you are simply looking for a gentle skin treatment, This is also formulated for dry to very dry skin so with the SPF also gently added it should give you with a subtle form of relief. You can use this year round in winter too to protect against cold air. 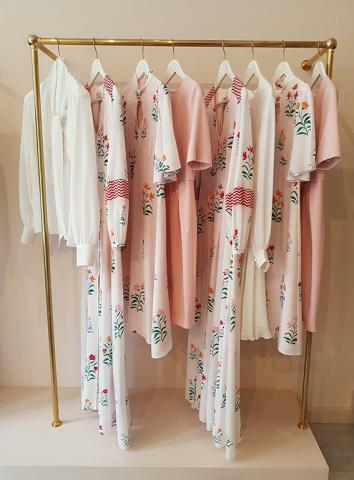 Exciting times once again for Beulah London with the new Spring - Summer 2018 collection debuting in their boutique before the move the a bigger and brighter home at 77 Elizabeth Street. 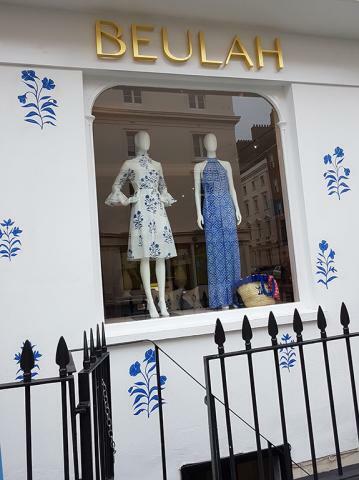 In typical gorgeous Beulah fashion I had to show images from both stores here as they are both really lovely. 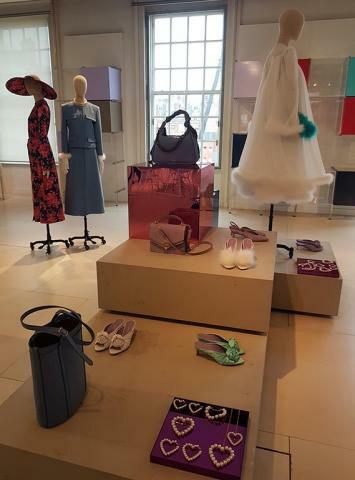 This beautiful display was the perfect welcome to the new season collection and inside as well as out, beautiful flowers where one of the key features of the collection. 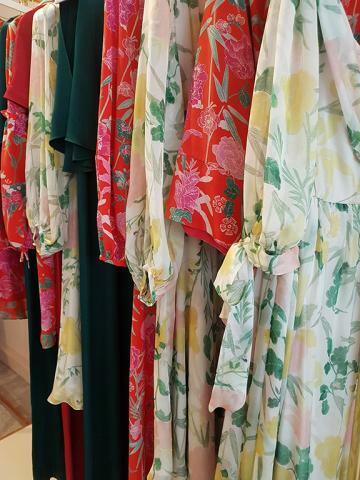 Inspired by the warm colours and bright flora of India the collection moved through three main colour moods. Above the Anjali floral camisole top and the Seren tired floral skirt form a flattering and eye catching combination above and are easy to mix and match and wear together. 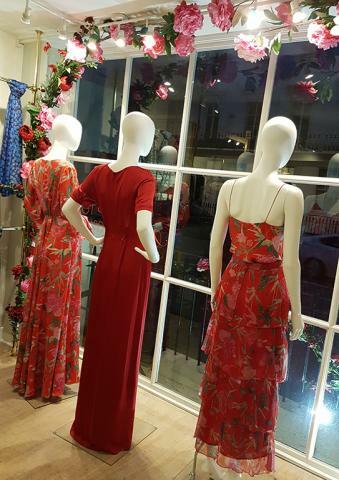 To the right the appear closed to the camera in the window alongside the classic Beulah Painted Lady dress in Raspberry and the Prisha floral long dress. Below to the right you can see another close-up shot of the look which perfectly flatters a taller slimmer or elongated figure. Beulah was born as a business after founders Natasha and Lavinia spent time in the Delhi slums helping women in an aftercare following harrowing experiences in trafficking and slavery. With no former experience in the fashion industry they taught themselves the principles of design and set about establishing a business that could help the situation by offering employment to women in a similar situation in India and raise awareness of the suffering. With a lot of support from family and friends and spreading the news of the business initially by word of mouth, they set about the task of establishing design production in the UK and also at their partner charities in India such as Freeset and You Can Free us who work on the ground in India employing women to give them a new source of income. 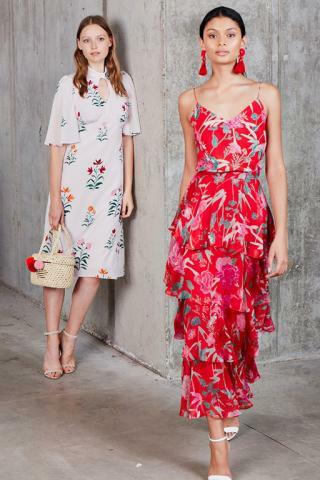 Below to the left the fun Prima shift dress combines floral detail and the line patterns of Indian ceramics to transpose to traditional Indian art onto an easy to wear Summer piece. It's light and easy to wear and it also has the dual capacity to keep you cool in the heat and guard against cool breezes in the evening. You could wear this anywhere, for a party, drinks or pack away into the travel bag. To the right below a beautiful frieze of colours in this rail-shot that somehow looks good enough to eat (I'm thinking of healthy salads each time I see it). 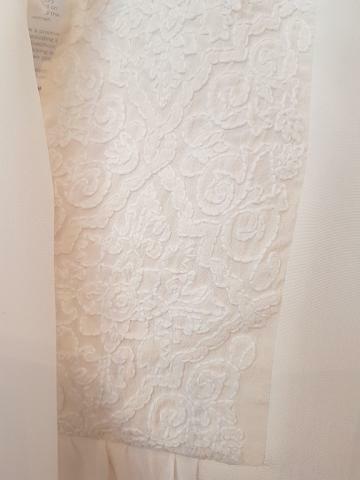 The sympathetic cut of these gowns takes a really interesting look at blending contemporary western and eastern styles and there are wide variety of options for formal and semi formal wear. 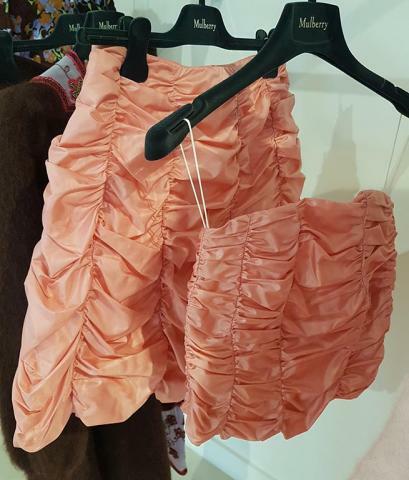 Lavinia, Natasha and the team have created pieces that you can wear for lunches or drinks or dress with a hat from a leading milliner such as Vivien Sheriff or Laura Cathcart whom they've collaborated with in the past and wear it to a Wedding, Christening or the Races. India is well known for it's heritage in cotton garments and the beauty of the embroidery work produced there. 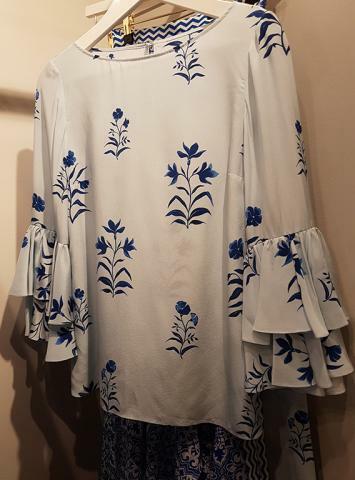 Below a delicately designed white Mahika blouse features a tie neckline and celebrates the dual style heritage between the United Kingdom and India. It's an easy piece to coordinate with almost anything and would easily find a home in a Winter wardrobe as well. Below a close up of the yolke neckline embroidery detail that also features at the cuffs. These are hand stitched in Bangladesh by women who are part of the Thanapara Swallows project. 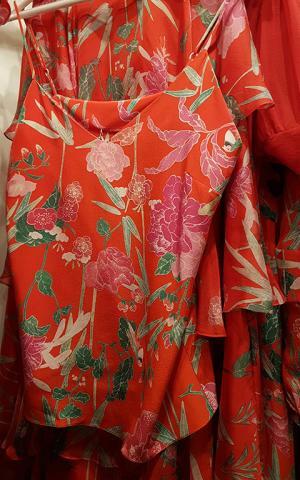 Some shots from the Summer 2018 look book show the designs expressing the movement on the fabric. 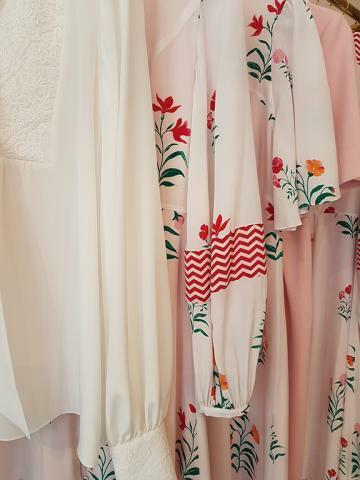 Above to the left long-line Prisha dress in mixed floral on white fabric and floral pattern on red is an easy elegant piece to wear and particularly flattering for taller clients. 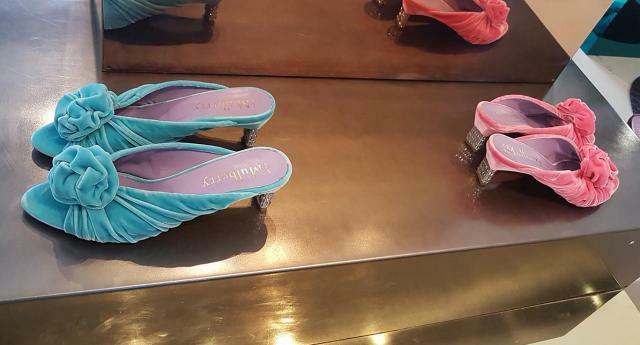 Both colour options can be worn to show more or less of the leg and have a strong 1970's echo. 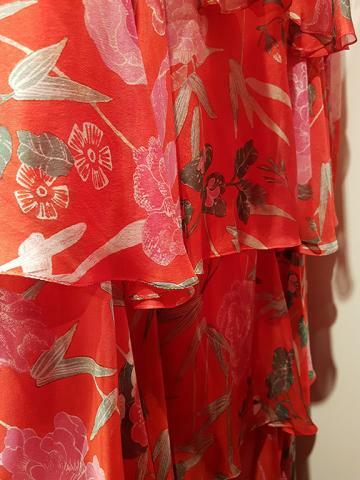 The Prima shift dress offers more options to show off healthy toned legs and and nipped at the waist and the neckline it hints at the shape of the flower. It's neighbour in the central image, the Shifali Floral knot piece is similar but cut to a slightly more formal and pared down style with sleeves, slightly cape-like reaching to just above the elbow. A beautiful pom pom woven purse in her hand is part of the new season sustainable accessories on offer. 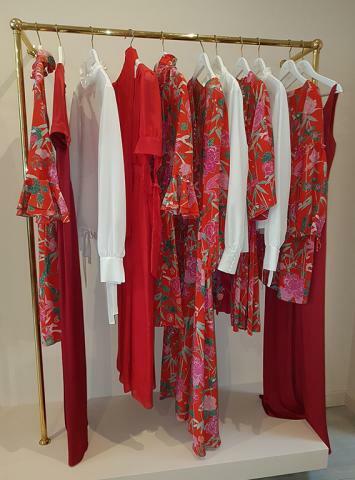 A tied wrap dress is handy thing to have in any wardrobe and the Ratna dress and it's neighbour to the right, the Zoya jump suit in red chiffon, are well thought out contemporary staples. With jump suits now on the list of styles choices permitted in the Royal enclosure, we can expect to be seeing this look in some interesting places this Summer. Cut gently this is a comfortable piece to wear during a long day out and about during the summer season. Image credit Katrina Lawson Johnston with makeup by Charlotte Cowan. 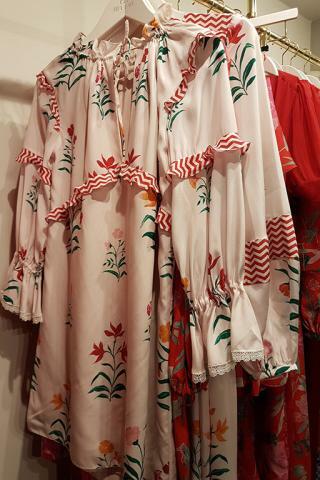 This beautiful mini dress plays with a 1960's vibe and is a very diverse piece that could be worn in many different places. 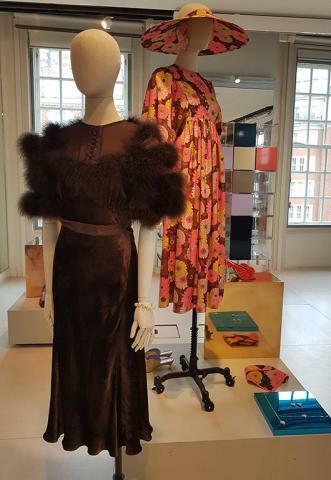 One of most eye catching pieces of the collection shown in the rail-shot above is the single shoulder Malati floral dress that flows gracefully around the figure as the model walks. 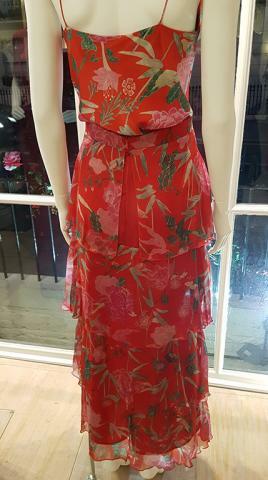 This dress would make a stunning entrance at a black-tie event, evening Summer party or warm summer days when you're entertaining. In a multitude of tiny folds it creates volume in a very subtle way. It calls to mind having lunch or dinner outdoors in sunny places and the prints need to be seen close-up to really appreciate the detail. 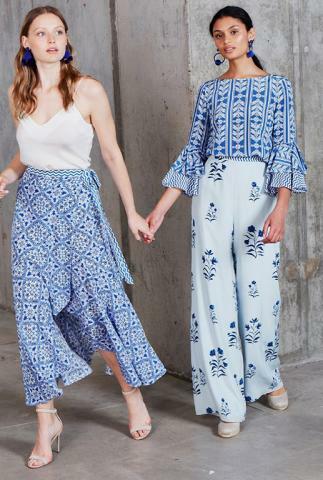 The Samira broderie anglaise top and coordinating Saanvi culottes offer a relaxed summer look for the town or by the beach and the paired pieces could be split up as well as worn together. 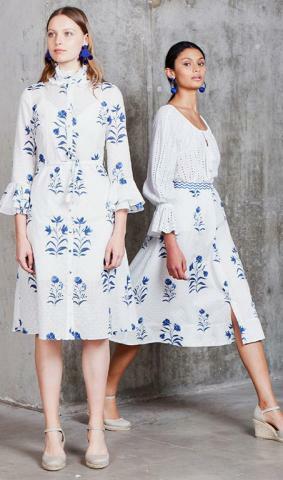 The broderie anglaise pieces through the collection are made in India with cotton from northern India. Another blouse to the right again also highlights the simple elegance and beauty that can be found in white cotton. The Ahana classic broderie anglaise dress centre above is a simple elegant day dress that you could wear to relaxed offices environments as well as for leisure. Nipped in at the waist, it creates an A-line skirt in it's length and is subtly flattering. 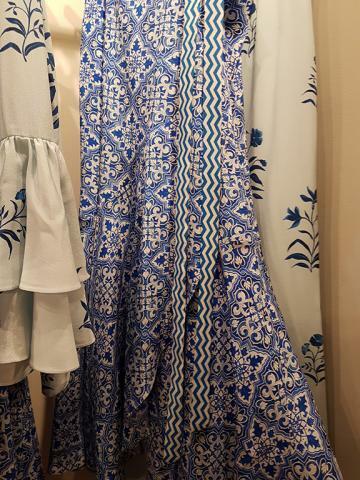 Many looks in this collection could also be worn in this way including the Silene midi dress above in the pattern creates from the beautiful tiles of Jaipur and the Devi floral broderie anglaise Kaftan knee length dress. 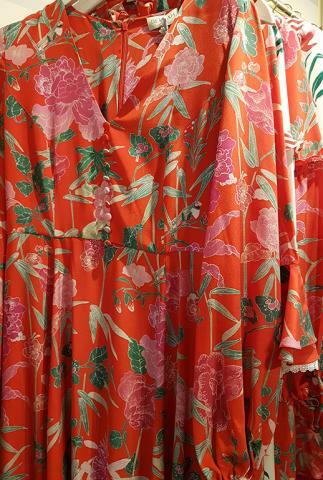 This is a beach to bar piece but could also be worn on very hot summer days. The Silene midi dress in it's fit and flare style and mismatched tile prints is a very flattering dress. The Beulah separates for Spring and Summer 2018 combine really well with a pair of classic jeans, especially the white cottons and here you can see the Mahika blouse featured above with the beautiful embroidery made by the women of the Tharapana project. 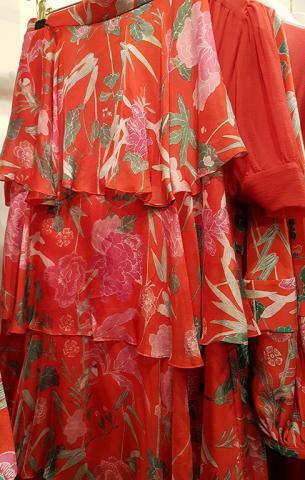 The Lily floral dress is a classic day to evening piece that flatters with a gentle floating hem. 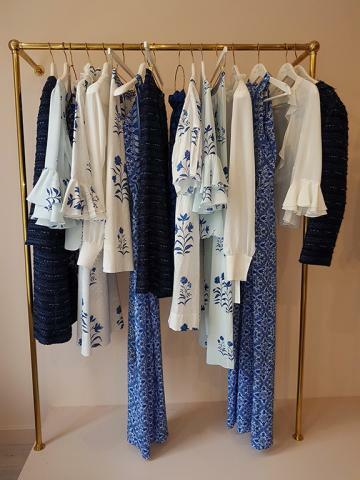 The Maia blue and white broderie anglaise shirt dress nipped in at the waist is another popular Beulah classic brought back this season in a new print. Easy to wear for a variety of occasions it could also partner with beautiful millinery. The Aruna floral skirt is a natural match for tops and blouses from the collection to be worn tucked in or softly sitting over the figure. 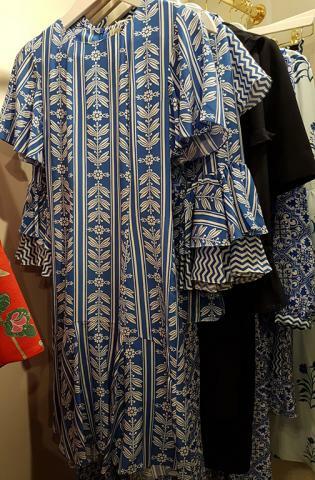 The Aasha off the shoulder dress is perfect dress for warm days and nights anywhere in the world and the bold tile pattern is eye catching yet subtle as well as flattering to a variety of figures. The Kanta silk wrap skirt is very handy to have for travelling with as well as day by day at home in the warm summer months. It's soft wrap around style means getting ready takes no time at all. 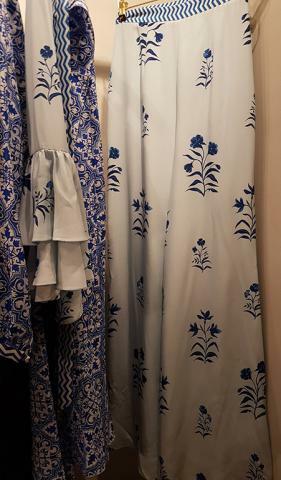 To the far right the Manisha floral palazzo trousers and Meena floral border top make a bold combination combining three different prints. Far from over powering they make a charming style statement. 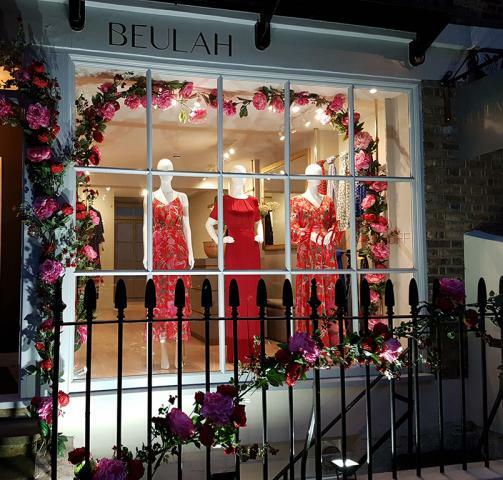 Part-way through the new season the Beulah team opened their new boutique at 77 Elizabeth Street. 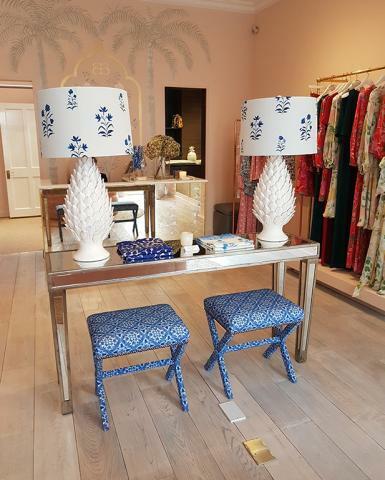 Inspired by the colours of Jaipur in Northern India the soft pink and eastern facing aspect fill the boutique with light and recall the beauty of the whole country. 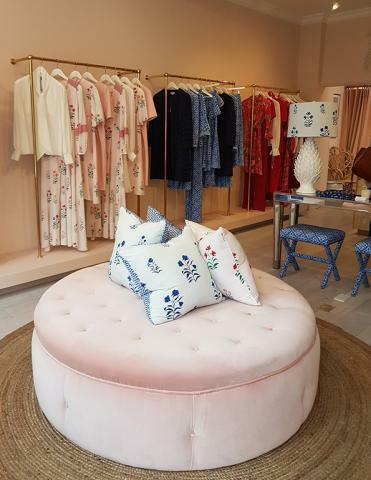 Inside the rails feel like they have a just the right space to show the collection in a composed setting with room to also show the home-ware pieces including cushions, lamps and dressing room stools that can be found on the boutique. The interior look is courtesy of Rebecca Hughes Interiors and is a wonderful showcase too of the work of this talented designer. 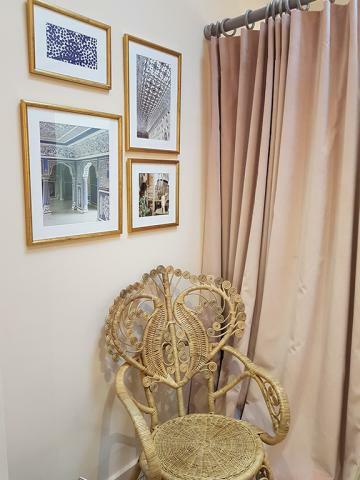 Pictures of India line the dressing room area walls and hand painted golden murals recall the rich heritage of the sub-continent and it's lasting beauty. Grouped around colour themes the collection meets the eye in a sympathetic way blending gently with the backdrop and bold patterns are enough to draw the eye without seeming too over baring and complicated. 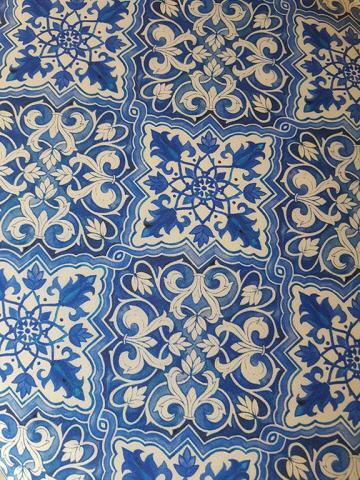 Taking inspiration from the tiles found in so many places in India is an uncomplicated and natural way to bring some of the heritage influence back to the UK and it's one of the most memorable parts of Indian craft that people carry with them when they leave the country. 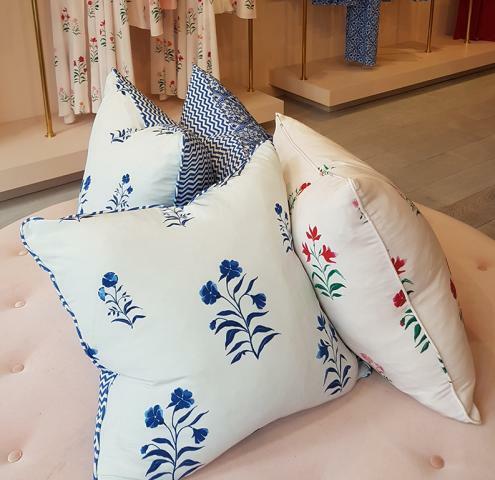 Expanding into home-ware seems like a natural next step and for a boutique that has a dressing room feel to it, it perfectly completes the mood. 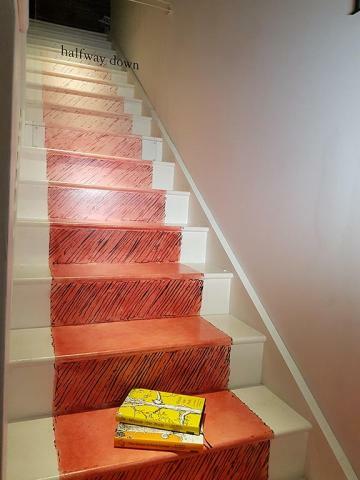 The playful juxtaposition of the tile prints on either side highlights how well the different designs work well together within their colour themes. 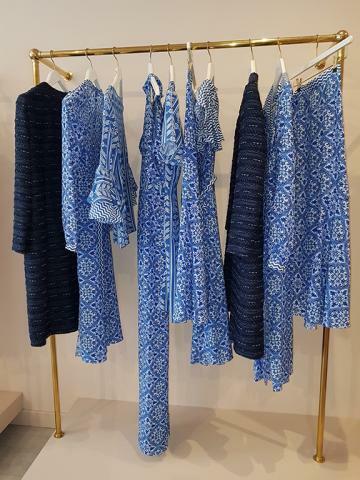 If you're looking for a special outfit, a scarf or home-ware accessories or would simply like a way to support the charity, I would recommend getting in touch with Beulah through the website at BeulahLondon.com or popping along to talk to the team in Elizabeth Street. 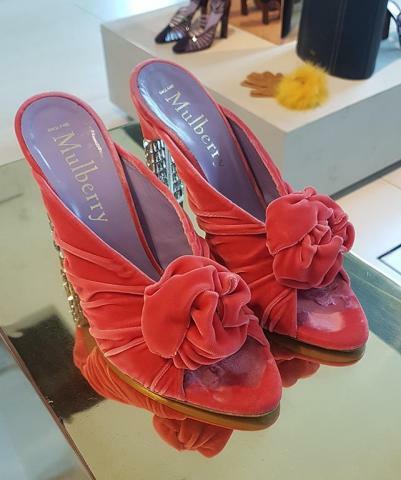 It was lovely to spend some time with the Mulberry team out of the chill winds of Spring and find out what was in the pipeline for the autumn. 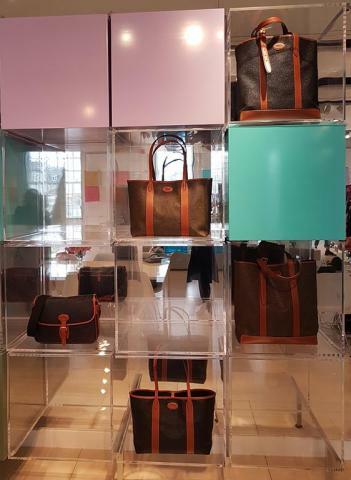 Upon arrival after saying some "Hello's" my heart skipped a beat when I saw the offering of no less than a series of classic styles that use the Mulberry Scotchgrain in the design. This is what legions of women and men still treasure in their collection of accessories and what many are still searching for daily all over the world in second hand emporiums. If it sells and people are still in love with it, why not bring it back. I recall mentioning the love of Scotchgrain to a senior team member back in the autumn in Paris and was delighted to see that this had magically come into being for next season. 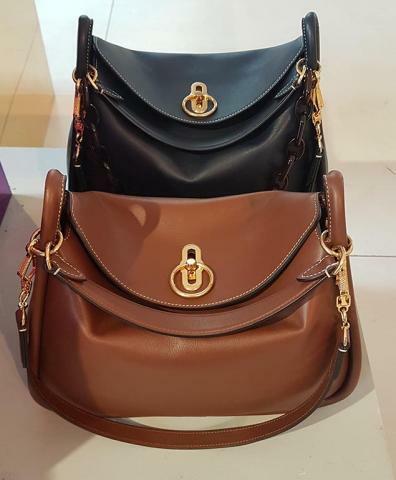 I feel that Mulberry must surely have a success on their hands here, these pieces are truly timeless with tested and sustained international appeal. Above and below to the left you can see two styles of Tote bag that will be available in mid and dark brown. 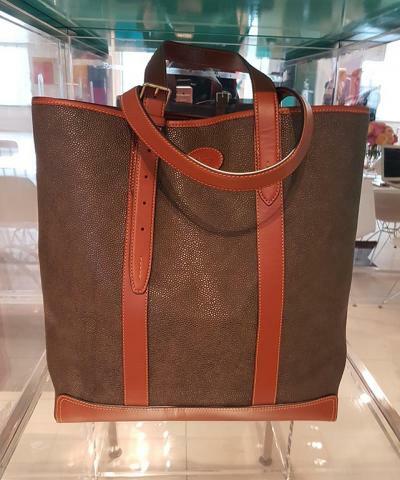 The easy day bag that contains plenty of room for everything you need when out and about and it can also just about double as a stylish overnight bag. 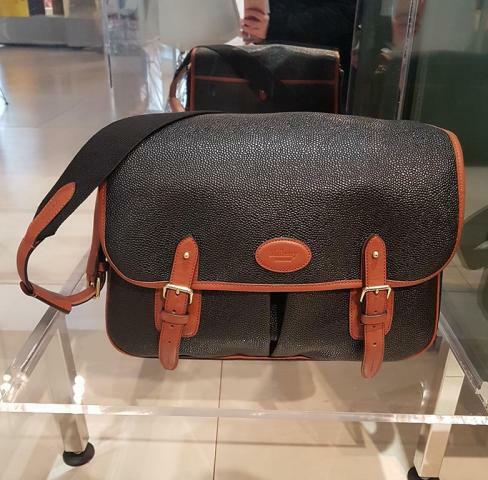 To the right the Heritage line Messenger bag in black with Cognac piping channels the traditional trout bag. With it's two handy small pockets is gender neutral and can easily fulfill it's original purpose on the river although it's perhaps more likely to be seen around towns, villages and in the airport. To the right a nod to the trend for backpacks and a useful piece to cater for busy professionals, ladies about town and students with bigger budgets. With a slight hint of the gusset in the new look Bayswater bags, this piece folds away easily against the figure. opposites and the fusing of many ideas. Simply put I would say this collection is about finding harmony in abstraction. 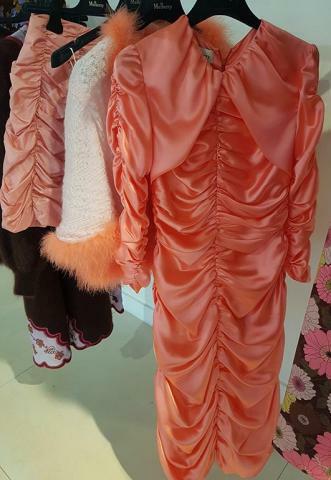 Pleated folds in a Blood Orange blouse are paired with neon Pink trousers that widen at the ankle both sit under a lightweight Caramel faux fur coat also reminiscent of the 1960's and 1970's. Soft rosettes crown velvet mules, ruched on either side of the foot they look like magical companions to understated evening dresses. Their slip-on style and comfortable wider fit is designed to leave the feet feeling happy through an evening or day as well as looking stylish. The eternal classic hobo is set to arrive for the new season in medium and dark Brown. 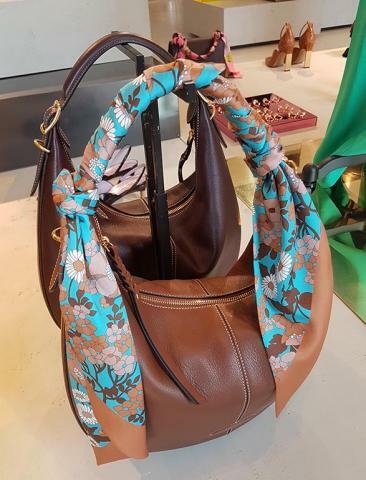 Weaving in a fun styling idea that I've tried myself in the past, twisting a silk scarf around the strap of a bag is a fun way to add a different touch of colour to a look and possibly coordinate with your broader outfit. The show-room was brimming with ideas and while the accessories lines took several directions the womenswear never veered away from the essential sweep through the later decades of the rock and roll era. Floral notes where key to the look. 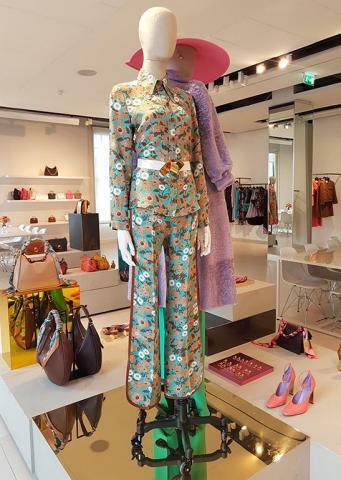 Here above to the left a day suit in blouse and trouser combination fringed with golden piping and fastened at the waist with a golden curl is a simple luxury statement in the theme of opposites of fabric and form. 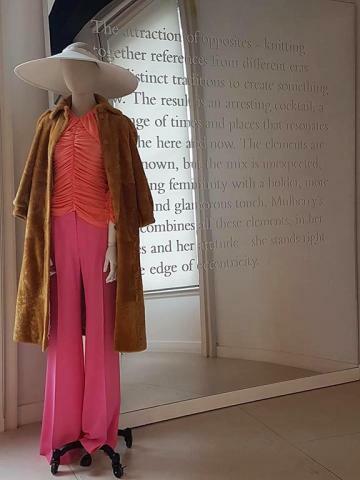 Behind it a Lilac day coat dress is teamed with a bubblegum Pink hat fusing the norms of formal wear attire with the vivid colours of pop art. 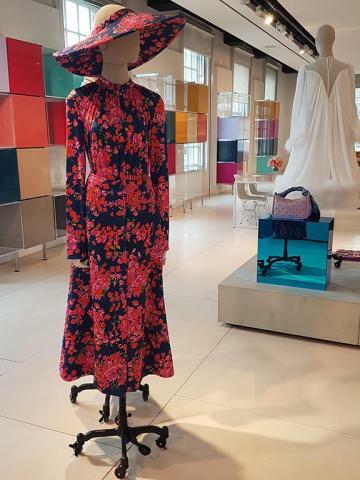 Coca's innovation seems to be to remove the crown in the millinery pieces of the collection leaving the wide floppy brims that characterised beach wear in the hey-day of Brigitte Bardot and Audrey Hepburn. 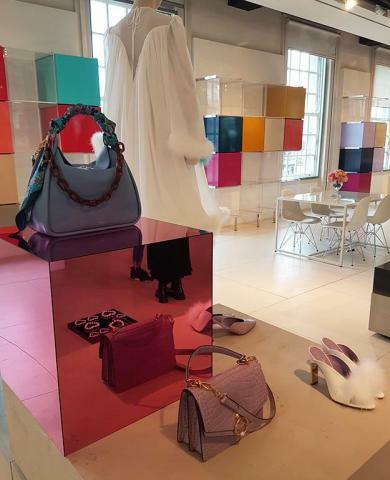 The accessories in the non-Heritage part of the line explore numerous shapes and themes is anything more connected through their shared exploration of playful pastels above anything. 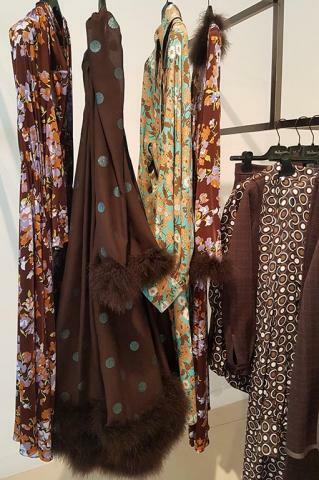 Buckles, scarves wrapped around handles and sensible styles point to a theme of granny and great - granny's wardrobe with a twist. A hint of 1960's boudoir chic appears in the fluff-edged baby doll dress with a dipped neckline and back-drop detail. Dropping in an almost tulip shape to the lengths this could be a red carpet dress for colder evenings as it's gently layered to keep out the chill but won't leave you too warm either. A powder blue suit adapts the fluffy fringe motif to a pair of gloves worn as accessories along with layers of pearls at the neck and puts a spin on tradition. 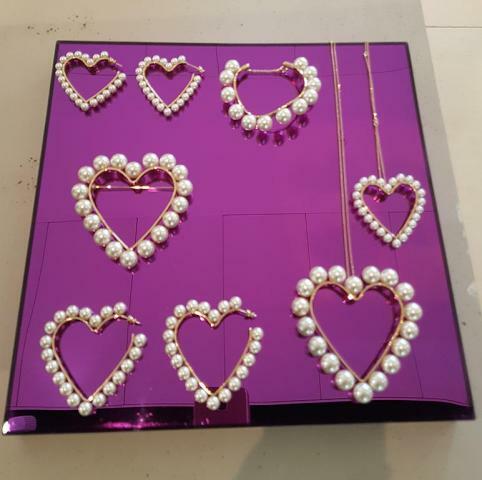 Playful themes of romance and love drift through the collection and put most simply in the form of the classic British Pearl decorated heart-hooped earrings and necklaces are the calling cards of love. Across the collection the sweetness of many of the designs has an undeniably romantic air to it also. 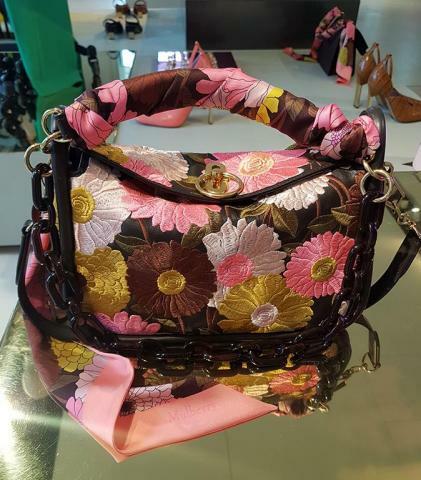 Embroidered flowers crafted across the canvas of the new season small Leighton bag with it's scarf carefully wrapped continue the journey of looking 'Beyond Heritage' that Mulberry is cheerfully exploring. 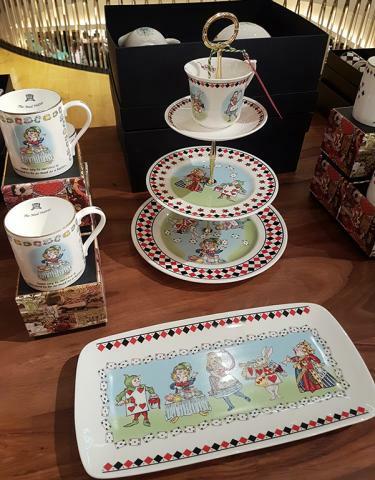 As one of the best known British fashion Houses in the world, it's a brand that people look to for a touch of heritage (if not purchasing iconic legendary House accessories), while finding something new to explore. To the right above a closer look at the rosette detail featured on many of the shoes. 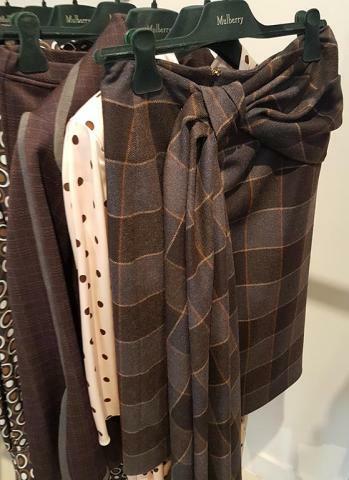 Returning to classic dark autumnal shades the plain check design appears in hats and in tailored garments including skirts, jackets and blouses. The gentle slouch of the hobo has versatile appeal for the autumn wardrobe and these looks have easy appeal for a new wardrobe look. 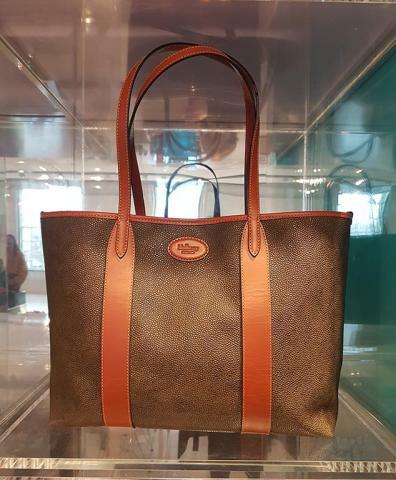 Also what's often not pointed out about Mulberry is it's cherished place as a leading 'special gift' brand amongst British Houses especially in terms of the bags. 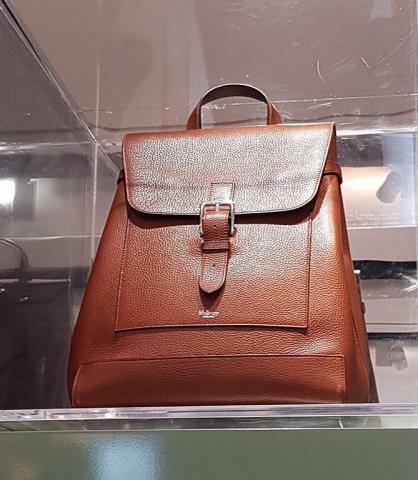 Birthdays, Christmas and Easter, exam passes, that new job you were hoping for, Mulberry comes to the top in many wish-lists. 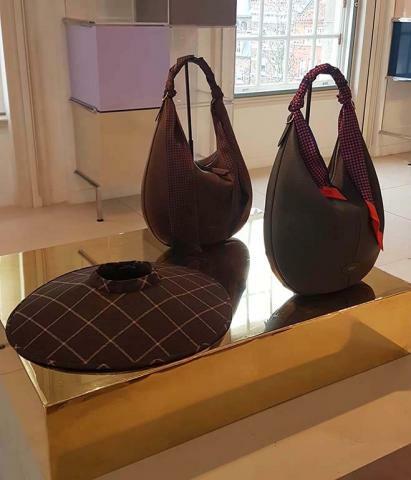 To the right below, two further Leighton's, a small in Tan and a large in Black offer another flexible work/leisure style option for the new season with golden postman's lock detail at it's heart. Romantic ruching adds a touch of theatrical display to several of the looks through the collection. Above in soft Peach, a dress reaching to mid-calf length and a more daring bodice and mini skirt transform a staple of Victoriana into updated designs. The two piece look is a perfect outfit for clubbing and drinks (as long as dress codes allow a waist to be shown) and would be a wonderful look for the party season towards the end of the year. To the right a similar full length sleeveless dress appears in Turquoise Blue that also seemed to be sitting on the rails waiting to be picked up to go to party. 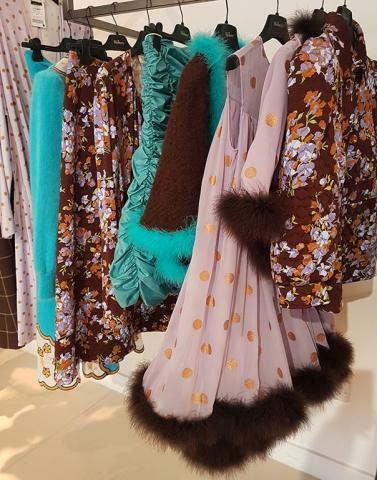 Florals dance through the collection with blouses, skirts, jackets and dresses all scheduled to bring colour pops to the darker days of autumn. 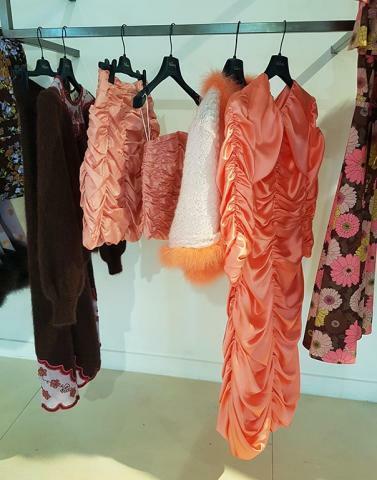 The tulip hem fringed in fluffy faux fur also appears in several looks here and some of the dresses with full sleeves take on a Russian/Austrian winter look that's hugely romantic. Plenty of scope if you're looking for classic tailoring that's remembered it's sense of adventure and fun for the new season. 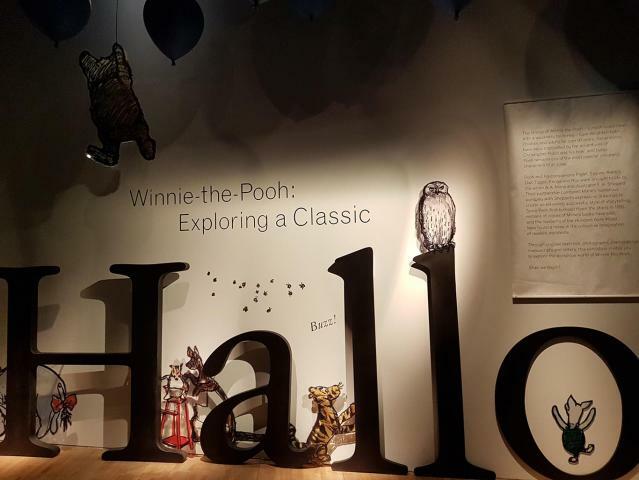 For several generations Winnie-the-Pooh has been delighting and entertaining children and their families around the world. 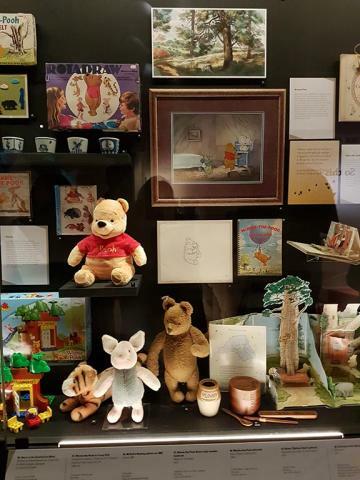 He's one of the UK's best known cultural ambassadors and this little Bear and his friends from the One Hundred Acre Wood in Sussex have been given their own showcase at the V&A. 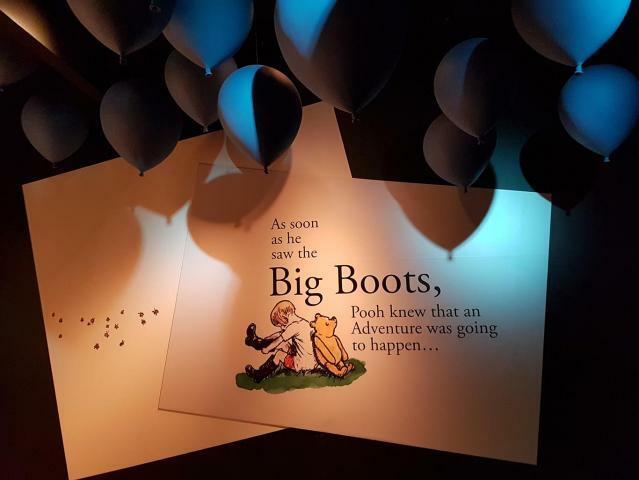 Stepping into Winnie's world we where set for our own big adventure and a reminder of what huge possibilities exist for children in terms of expanding their creative horizons amongst the pre-digital world of stories and ideas. Here they are encouraged to use their imagination and create new games, explore and have adventures in the outdoors, not in-front of a computer, television or phone screen. 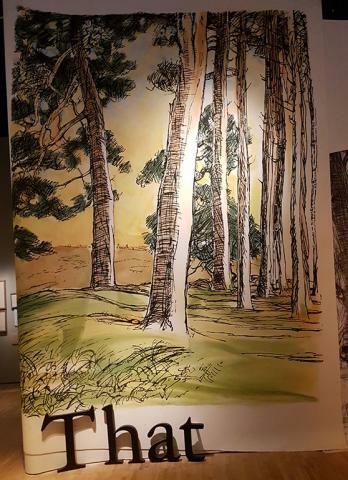 I was when little and am still, a great admirer of Winnie and his troop of friends and some time to leave the outside world behind and enter their Forest is a huge treat for children and grownups alike. It's all about the journey and the experience. Time to put on those big boots to join Pooh, Piglet, Tigger, Eeyore, Christopher Robin and all their friends out in the fresh air. 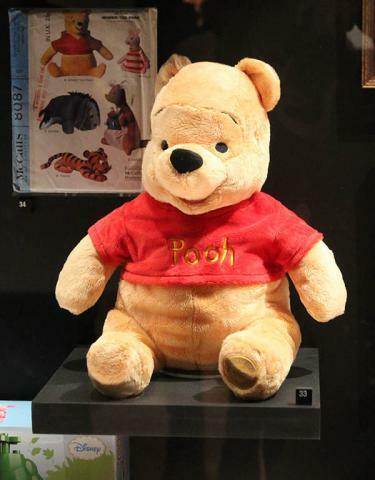 A cuddly Pooh Bear with his wry, jocular, innocent smile is one of the first things that greeted visitors upon entering the exhibition and his soft toddler like shape made him seem instantly cuddleable. After the early success of the novels an endless series of merchandise has come forth over the past decades of the most happy sort, earning revenue for the Garrick arts club in London and far more importantly filling bedrooms and nursey's across the world with Winnie-the-Pooh and his friends from the One Hundred Acre Wood. This surely must have been their greatest adventure of all but back to the story of how Pooh Bear came into our lives and collective consciousnesses. The genesis of Winnie-the-Pooh arose from the idea that journalist A.A. Milne had to create a series of stories around a favourite toy bear that belonged to his small son and so with the help of illustrator friend E.H. Shepard he set about creating a series of illustrated stories that celebrated the quiet countryside and also had a gentle but discernable ability, looking from my adult point of view, to teach children many valuable skills for later life. He may be just a little bear but his adventures and his questions, curiosity and desire to help others make him a natural teacher to small children. 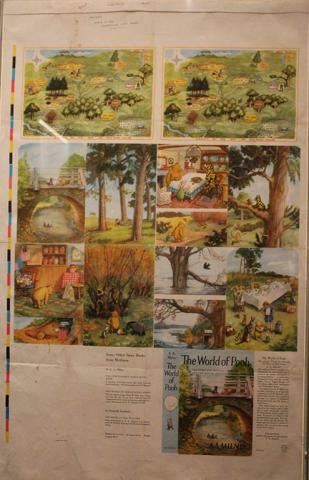 Above centre is one of my favourite illustrations that see's Winnie wandering through the country taking in all around him. A little bear having an afternoon out. 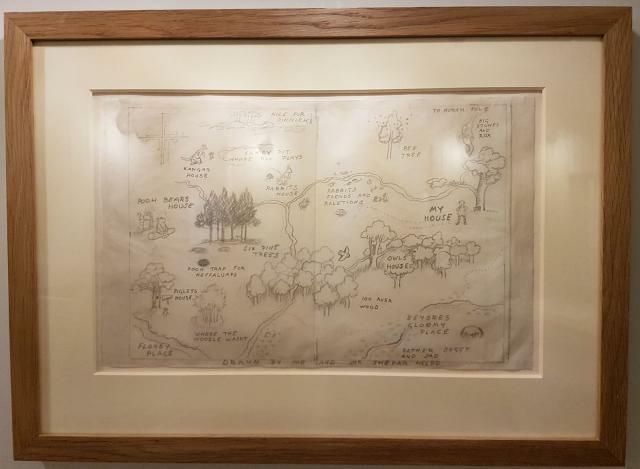 Above to the right a vital document, the illustrated map of One Hundred Acre Wood. 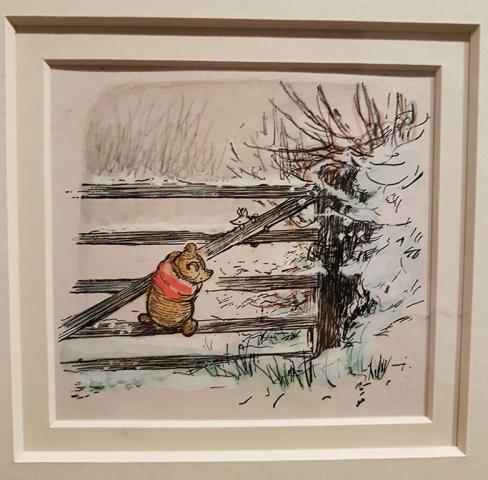 This collection of illustrations and early editions is the first exhibition of Winnie-the-Pooh in over 40 years at the V&A and the world's largest collection of E.H. Shepard drawings. to raise the spirits of the era in which they where produced. The first publication in 1920 followed the dark days of the First World War and during the 1920's and 1930's as the mood of that nation gradually lifted and life bounced back, for initially British children these stories became a way for them to feel grounded and happy in their home environment and put aside cares that spilled over from the adult world. 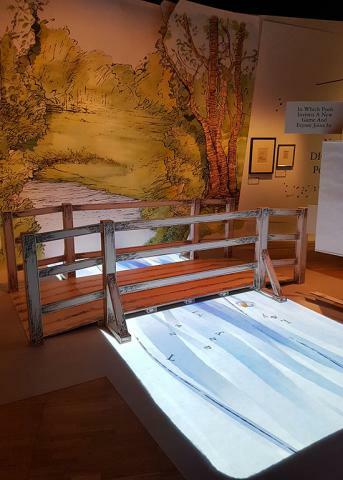 One of the most well known part of the Winnie-the-Pooh and friends story is the game of Poohsticks. Out for a walk one day with Eeyore, the little donkey that often needs a cheer-up, Pooh creates a game to cheer his friend. Poohsticks is a simple fun way to send time on a country river bridge. Each player finds a stick and drops it over the up-stream side of the bridge and then turns around to run across the bridge (be very careful if it's a bridge used by cars) to see who's stick comes out first. It's a good idea for sticks to look quite different to make it easy to see which belongs to each player. I have played Poohsticks myself in the past and think it may in fact be an ancient countryside game. Stepping onto the bridge in the exhibition I saw letters of the alphabet flowing beneath the bridge calling to mind the stories. 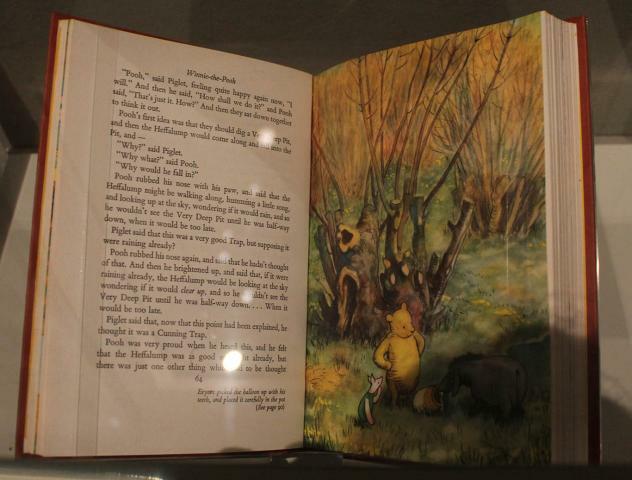 Poohsticks has stood the test of time and entered the collective conscience and today there are several Poohsticks clubs including a re-awakened one at Magdalen College at Oxford that represents the strength with which Winnie, Roo, Owl, Kanga, Tigger and others are remembered by many as they enter adult life. 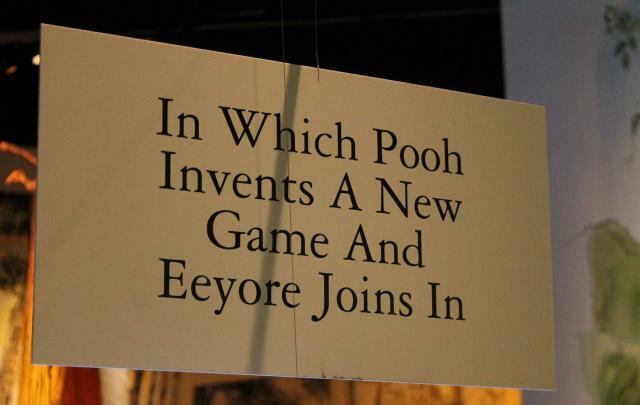 The game first played in the House at Pooh Corner has been played by millions. Through his stories Milne teaches many lessons and this may or may not have been the intention but I find it fascinating. One of Pooh's friends Eeyore is often a little low in spirits and I find this a device to teach children compassion. 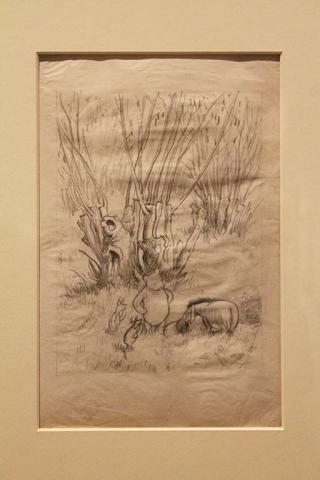 The other animal friends try to cheer him up and in one story Eeyore has a new house built for him at Pooh Corner close to the house lived in by Pooh and also shared later with Piglet. Eeyore belongs and is part of a community. As children grow and discover their own personalities and identity, so their confidence generally grows too. The outgoing curiosity of the animals leads to exploration of vocabulary, ideas and expression and expands their minds. 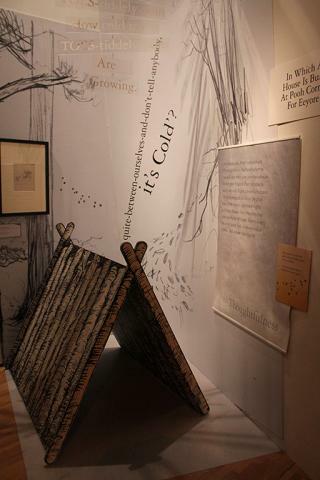 As is becoming obvious by my column here perhaps, I was struck at how the exhibition and the stories of the books offers such good mental and physical exercise for children. Children just like little Bears need to stride forth and make discoveries and put a sign up to claim the conquest. Alongside these adventures though there is no place like home and Milne goes to great lengths to express the soft comforts enjoyed in the home space based on the cottage that he bought for himself, wife and son in East Sussex. The family home in Chelsea where Milne, Daphne and the young Christopher Robin lived never gets a mention. Soft furnishings and a small fireplace, clock and gently sloping roof all have small echos of the traditional nursery at the top of the house while the place, halfway down the stairs, a spot selected in the way that children sometimes do in their living space conjures feelings of that special childhood space. Plenty of time for relaxation and enjoying Tea with all important Honey sandwiches. 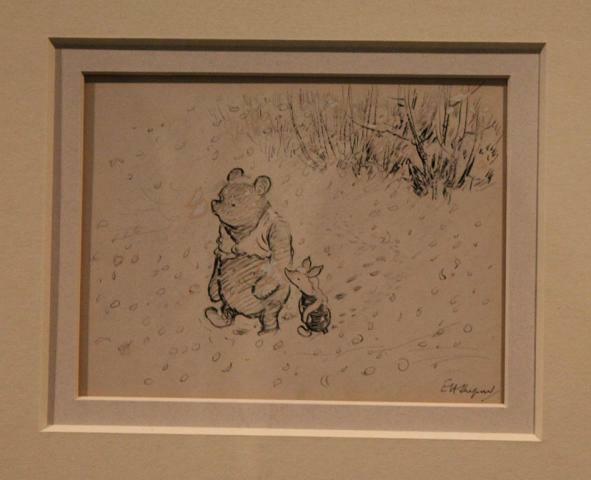 The colours are gentle and soft and the pencil drawing by E.H. Shepard was made large as part of the scene setting for the exhibition. 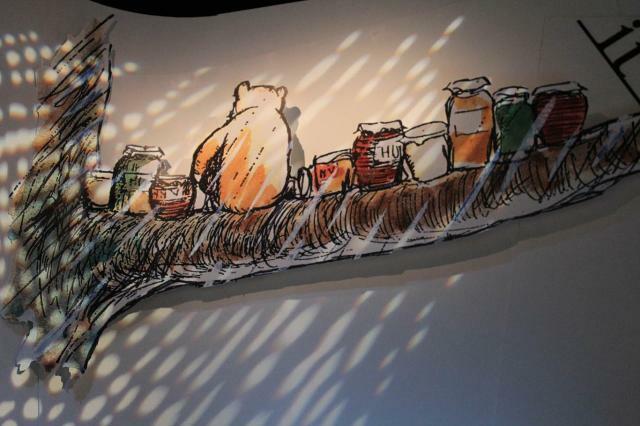 A Bear will always need Honey and this is a very serious thing for Pooh. It gave Milne ample opportunity to think up witty scenes and phrases of frustration from his leading protagonist during his tireless quest for the golden sweet liquid that was always some-how in the most tricky and out of reach places. It also to me again seems like a lifelong reminder for children to be tenacious when they step into the grown-up world and seek out what they desire. 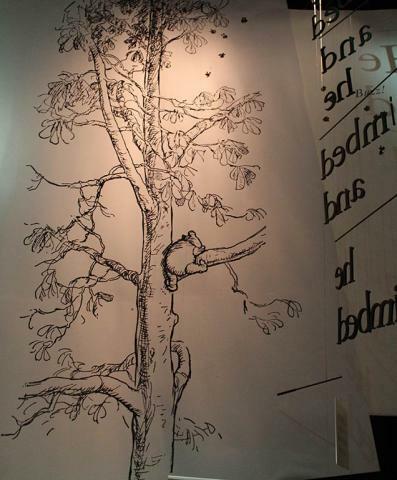 The illustrations of Pooh climbing the Bee Tree and looking for Honey are some of the most memorable in children's literature. 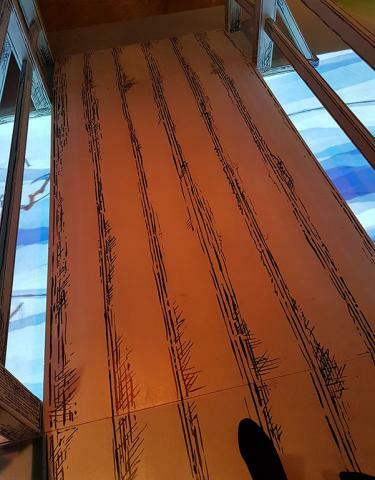 The exhibition has been designed to be interactive in many different ways that required their senses and perception. Children and grown-ups are encouraged to get involved. 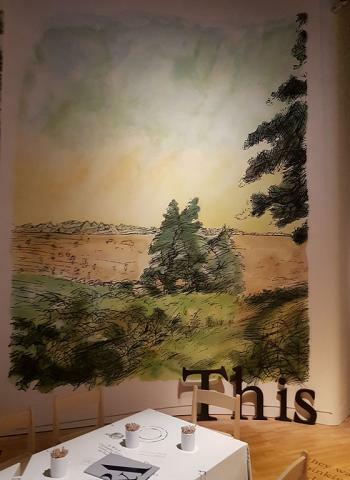 A table set with drawing pencils and a table cloth that you can write on offers an instant way for children to begin to express thoughts and ideas that they develop as they make their way through the exhibition. 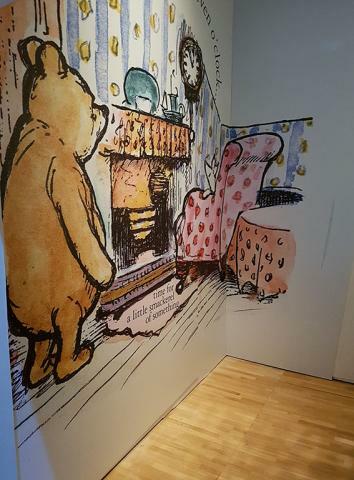 I think Milne and Shepard would have liked this very much for the children to become immersed in the world of Pooh and friends and become a part of it. 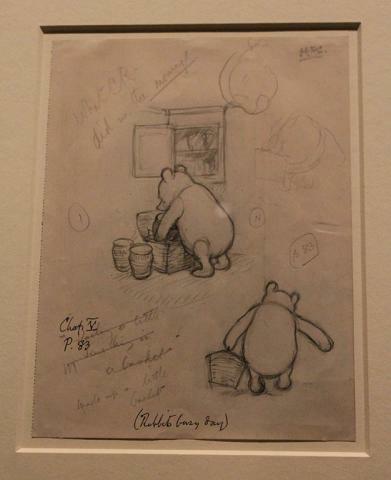 The walls of the exhibition are lined with dozens of illustrations from the very first tentative sketches of Christoper Robin's childhood toys after Milne got in touch with Shepard to begin the project, to the proofs and early editions of the books that where published. 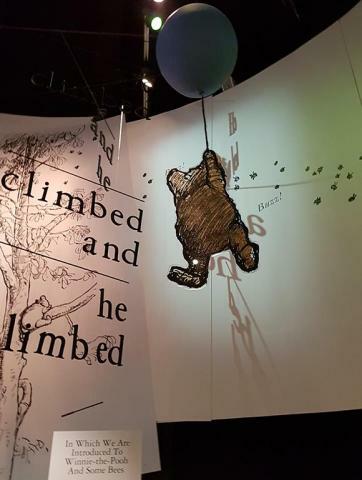 It also struck me that this was a very inspiration exhibition for budding authors too as you can see the journey that Milne took from conception of the idea through the finished series of books and beyond into legend. 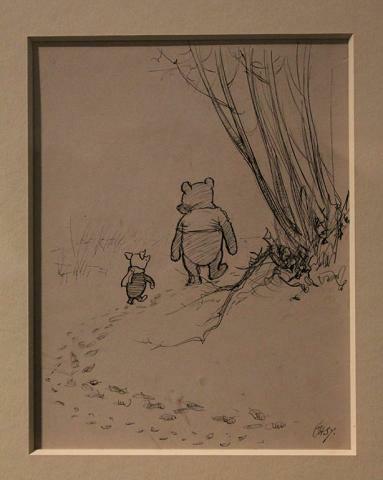 Some facts and figures that illustrate more of the story behind Winnie-the-Pooh; Milne and Shepard first met through colleagues at Punch magazine. Both had served in the First World War and Milne was already a successful playwright having produced several plays for the London stage. 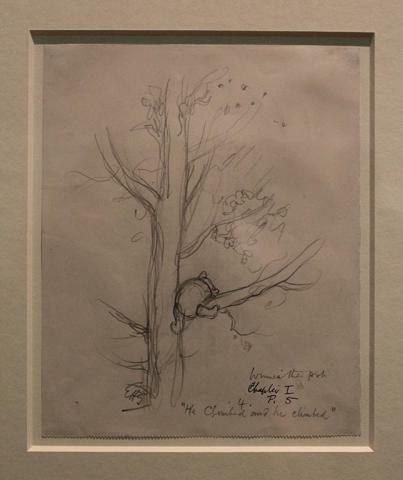 In 1921 Christopher Robin Milne received a teddy bear for his first birthday bought at Harrods and it was named after a bear he met at London Zoo. Milne started writing down the stories as his wife Daphne played with their son and his bear so the project was born from shared family experiences. 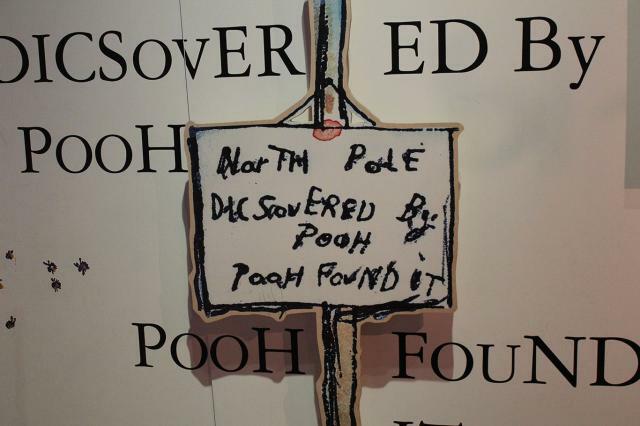 The landmarks of Pooh's world where discovered during Christopher Robin's regular trips into the Ashdown Forest near the families country home in Hartfield, Sussex. 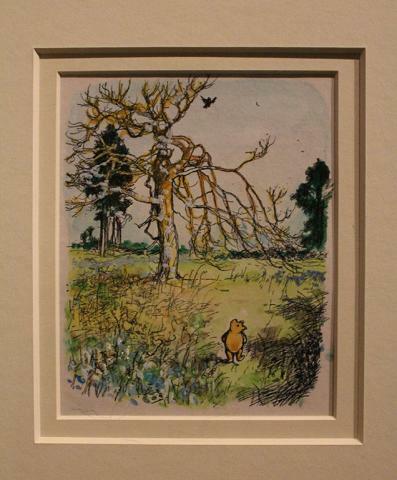 E.H. Shepard visited the forest that became the One Hundred Acre Wood to capture the likeness of the trees. Pooh Bear actually has a closer resemblance to 'Growler' the Steiff bear that was a toy of Shepard's son rather than that of Christopher Robin. Around 5,000 copies of "When We Where Very Young" were initially printed. Within three months the publisher had sold almost 44,000 copies. This initial success started the world wide popularity of the little Bear and his friends that continues to this day selling millions worldwide. 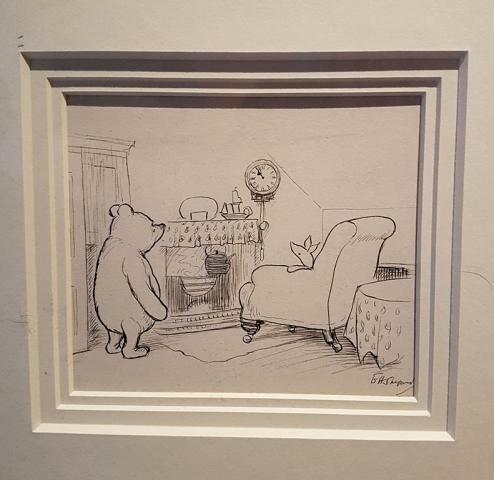 Stories from Winnie-the-Pooh appeared in the Evening News, Eve Magazine and The Royal Magazine and on Christmas Day in 1925 it was read aloud on children's hour. As Walt Disney's two daughters were huge fans he bought the film rights from Dorothy Milne and produced the first colour Winnie-the-Pooh feature released on 4th February 1966. Curated by Emma Laws and Annemarie Bilcough the exhibition in Gallery 38 of the Museum was accompanied by talks and special sessions for Primary and Secondary School teachers plus interactive art session for children and their accompanying grownups. 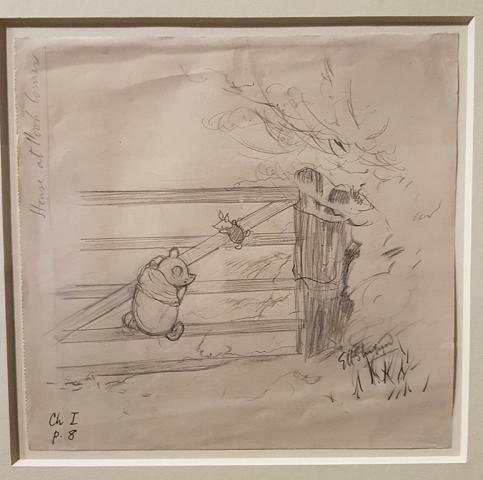 It was wonderful to spend time in the world of Pooh and meet his friends once again with adult eyes and see the huge amount of joy that this work continues to give to children and grownups alike. 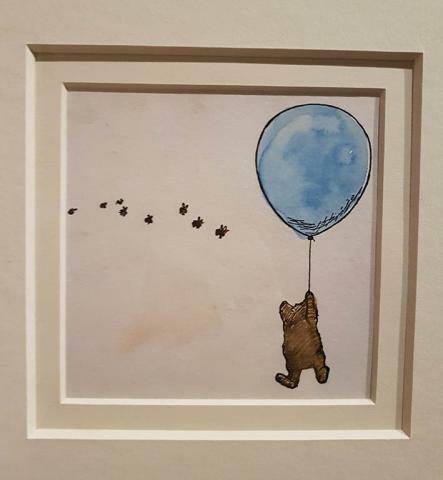 So for now it's a gentle Good Bye and time to fly off with a balloon to the next adventure. With his thick natural fur, this little bear is proofed against the cold on his winter walk with Piglet. During a cold Spring this was a very apt illustration and still carries the message that we should all go outside and explore and climb that gate unless there is literally a blizzard. Looking at the illustrations above, it's wonderful to see the artistry of Shepard adding the painted detail on top of the draft sketches. 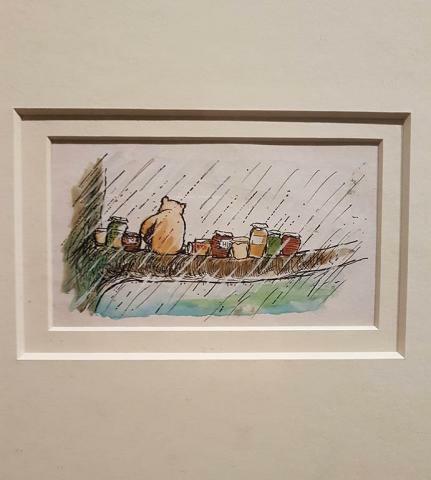 Pooh is sometimes described as a doughty Bear which is an old-fashioned word for a bit huffy and easily annoyed but he is determined and a determined Bear finds what he's looking for in the end. Honey. 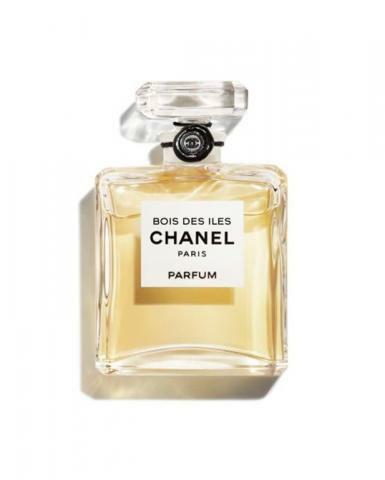 Many women across the world will have a Chanel fragrance in their handbag or on their dressing table at some point in their lives and for some of us, we are fortunate to be able to say that Chanel has been a fragrance mainstay in our collections across the years. 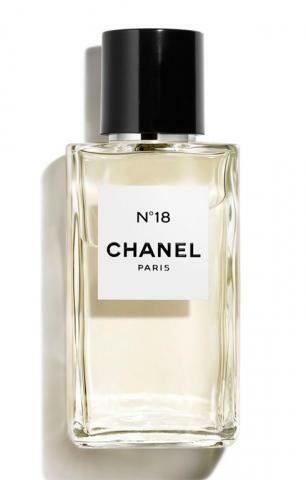 The House of CHANEL has a rich treasure of history from the legacy of Mademoiselle that it continues to draw inspiration from and this collection of scents, currently numbering sixteen allows the senses to wander through Mademoiselle's legacy. 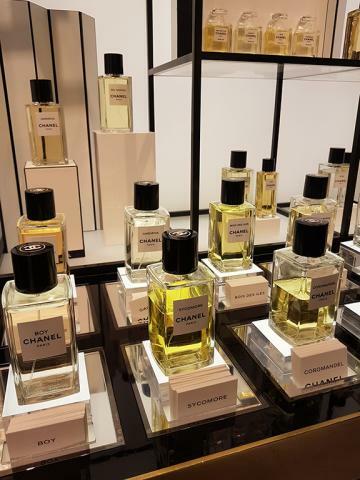 Olivier Polge, the Chief Perfumer of the House of CHANEL is only the third in the companies history, following in the footsteps of his father Jacques Polge and Ernest Beaux, the first Perfumer to work with Mademosielle Chanel. Retailing at £150 for 75ml and £274 for 200ml in the UK these are more likely to be in the special treats category for many clients but for special gifts perhaps to mark occasions. 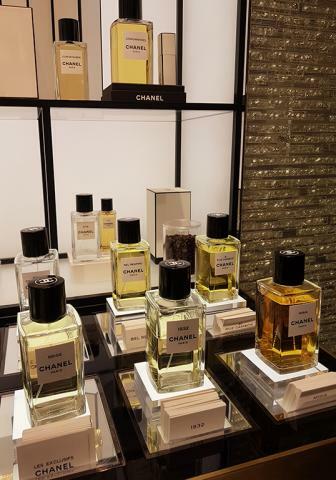 In the UK they are available at selected departments stores including Harrods and Selfridges and also at Chanel boutiques. 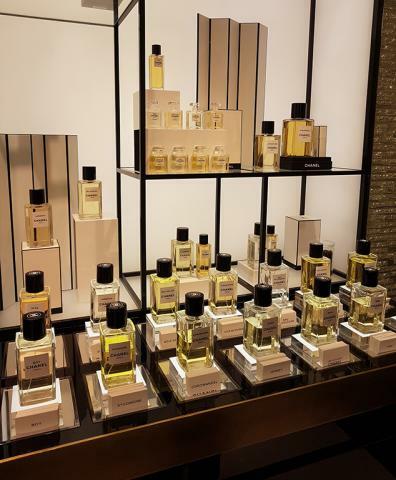 I take a tour of some of the scents in the collection and also note where some 'super sizes' are available that will have you set with your favourite fine fragrance for quite some time. 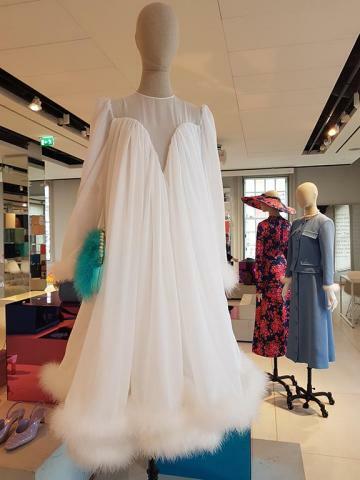 31 Rue Cambon is the spiritual home of CHANEL and the place where Mademoiselle opened her first boutique, atelier, design studios and also kept an apartment that, to this day is kept just as it was during her lifetime. I've shown a mixture of bottle sizes across this feature and above to the left the first three are of the 200ml size. 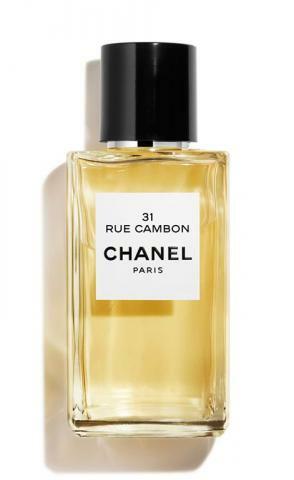 The scent 31 Rue Cambon uses notes that are described as Chipre, this is little hard to define but to me I've often thought as somewhere between floral and heavier incense with, a sense of sharpness about it. Described as Baroque in feel it channels a sense of completeness that encapsulates the nature of the heart of the world of CHANEL at this address. 1932 evokes the year that Mademoiselle launched her one Haute Joaillerie collection 'Bijoux des Diamants' in the Place Vendome at the heart of Paris. Jacques Polge created this scent in tribute to the lustre of this collection with the scent of Jasmine at it's heart and top notes to evoke diamonds. It is one of my favourites and has the gentle appeal of both day and evening. 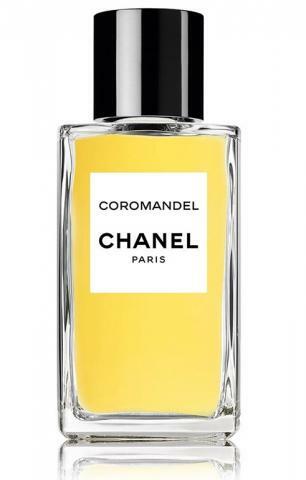 Rich Amber notes contained in the Coromandel fragrance evoke the warm beauty of the delicate carving of the Coromandel screens treasured by Gabrielle and still insitu in her Rue Cambon apartment. This fragrance is also available in a super-sized 400ml bottle for those who feel it's a perfect match. It recreates the heady experience of entering the world of Chanel with Incense, Benzoin and Patchuli. 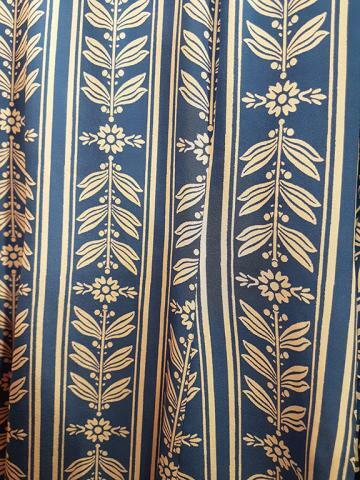 The woody notes of the florals evoke the flora so gently inlaid into the Coromandel screen. Gabrielle Chanel's home in the south of France, La Pausa which she commissioned in 1928, has become, like Grasse the flower growing heart of the fragrance industry, one of the central reference points for people looking at her work, legacy and memory. This understated perfume with Iris Pallida notes recalls the quiet views of the Mediterranean coastline. It's a floral woody-powdered fragrance that touches lightly on the skin. 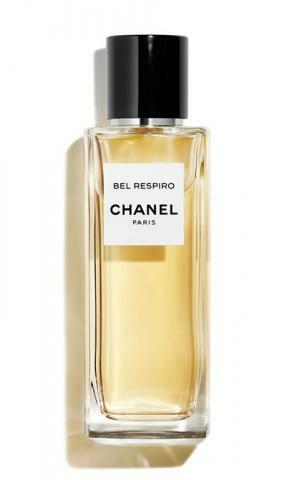 Bel Respiro evokes Gabrielle Chanel's other home in the countryside beyond Paris. The namesake fragrance was created by Jacques Polge to recall fresh open air with tender floral fragrances to bring the wearer into the garden of Mademoiselle Chanel. 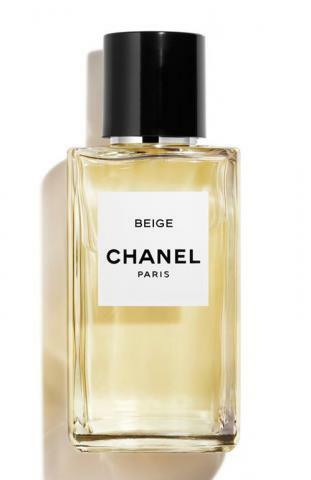 Beige was the earthy natural colour that Chanel always returned to throughout her design career and the blend of white petals of Hawthorn, Freesia and Frangipani and yellow gold created by Jacques Polge brings a soft warm option for gentle elegance into the selection and another favourite of mine. This is also available in the 400ml size in the UK priced at £385 as shown pictured above. Sycomore is another heady outdoor fragrance evoking the rich undergrowth of the country landscapes based around Vertiver with a hint of Spice blended in. Bois des Iles is one of the very first fragrances that she launched for Women in 1926. Seen here above in a pure parfum bottle the scent captures the hints of far-off isles that many Parisians and French plus her international clients dreampt of escaping to. It's warmth is captured by Ylang-Ylang blossoms from the Cormoros islands. Misia Sert was a friend and sometimes rival of Gabrielle in the swirling nexus of the Parisian arts and creative milieu. This new fragrance on the collection has been formulated in her image evoking the energy of dancers bodies. 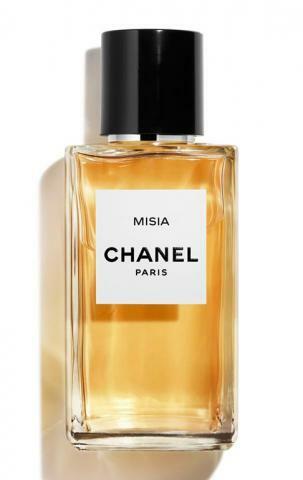 It was from Misia's world that Chanel developed the idea of formulating the Ballets Russe project that was to be so influential. The scent captures both beauty and energy with Rose, Violet and Leather tones. 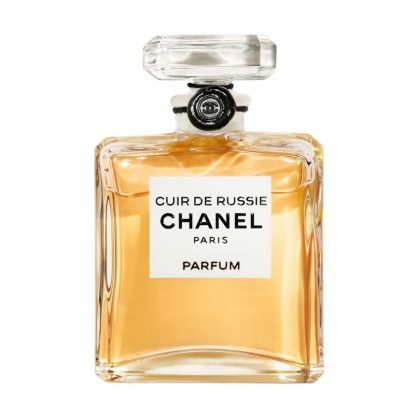 Cuir de Russe is a tribute to Chanel's friendship with Grand Duke Dimitri, a member of the Romanov family who with his sister in exile in Paris provided many inspirational points for Gabrielle in her work. The scent evokes horseback riding and the blonde tabacco and saddle leathers of Russian soldiers. 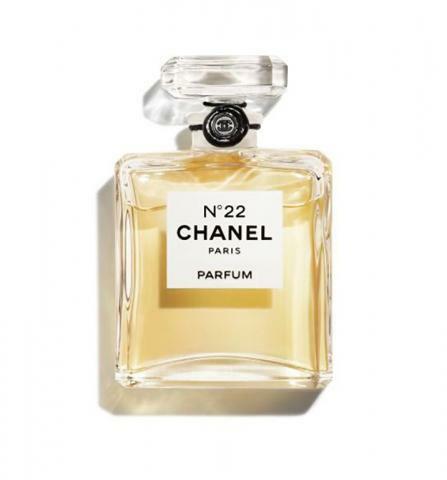 No.22 is a variation on the classic Chanel o.5 that was launched in 1922. It uses Tuberrose which Chanel noted for it's femininity to give and air of soft delicacy. No. 18 features both woody and floral notes of Ambrette seed and sweet flowers to create another sophisticated variation of scents found in nature. Some fragrances in this series are new, others have been in the collection longer but all seek to emphasise the brands heritage. 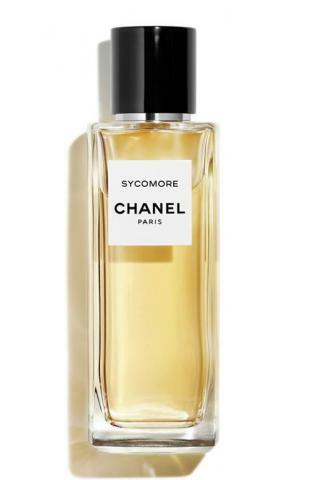 Originally some where only available privately for friends of Chanel but today if you're looking for something special they are a good place to start and a must for fans of the myth of Chanel.